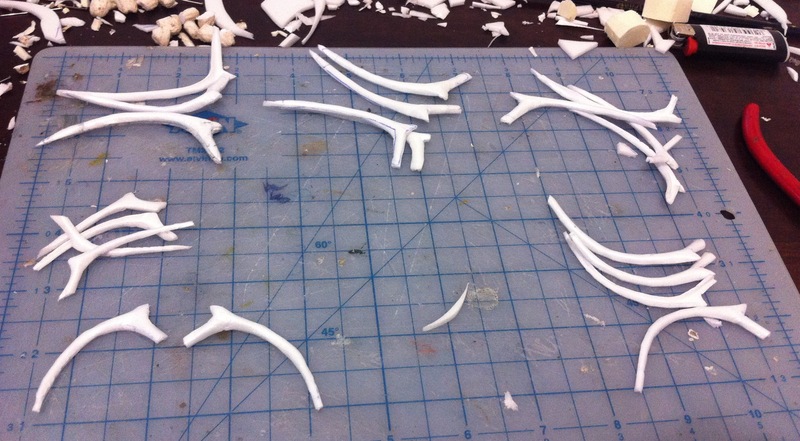 I’ve finished practically all the bones. 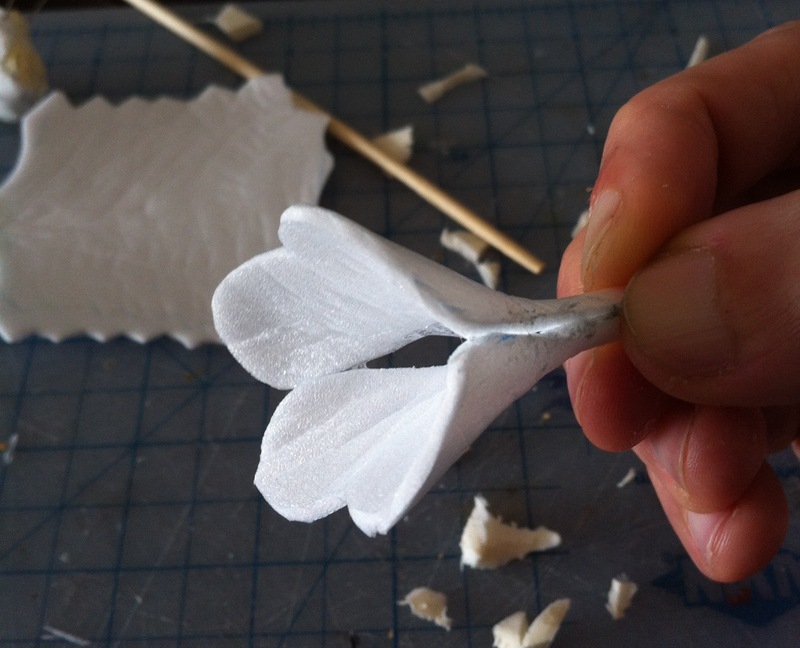 I still have to make a pair of lacrimals and post-orbitals. 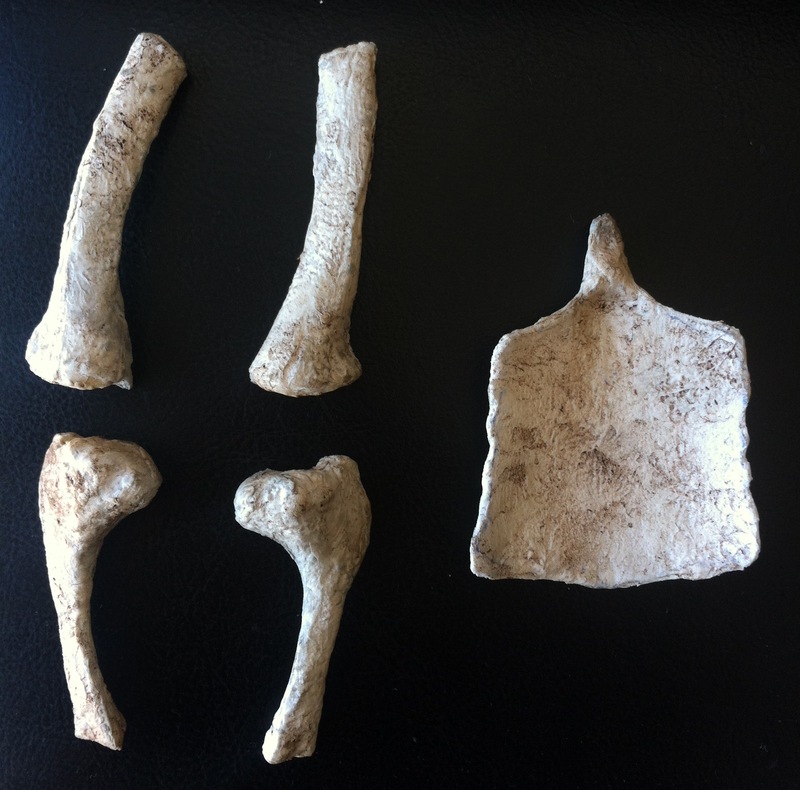 If I include them, the total bone count will be 198. 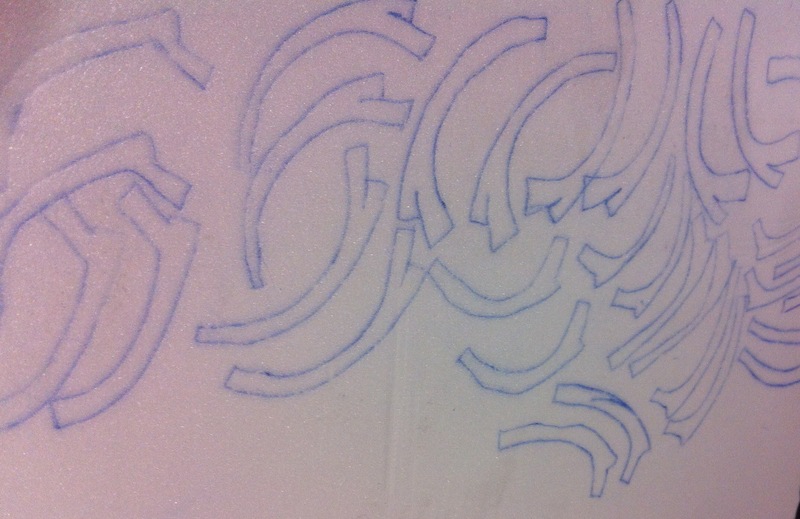 But I will fuse the lacrimals and post-orbitals, as I did with the quadratojugals (gluing them to the skull with epoxi). 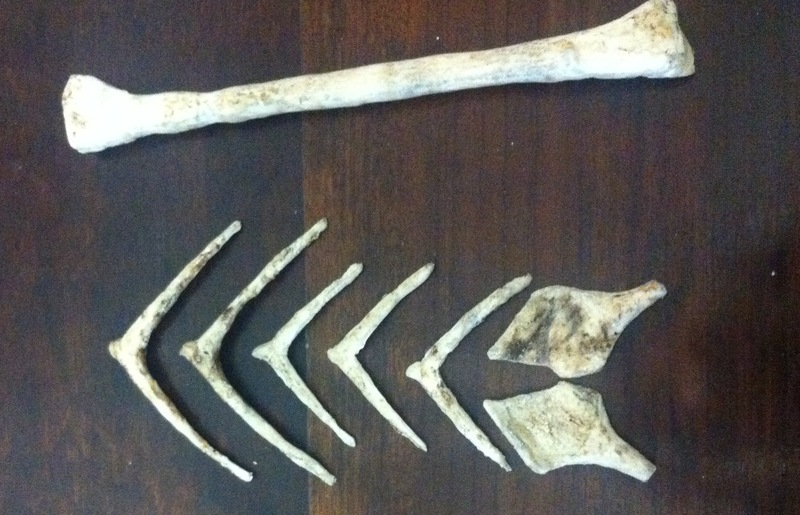 So in the end, the total bone parts will be 194. 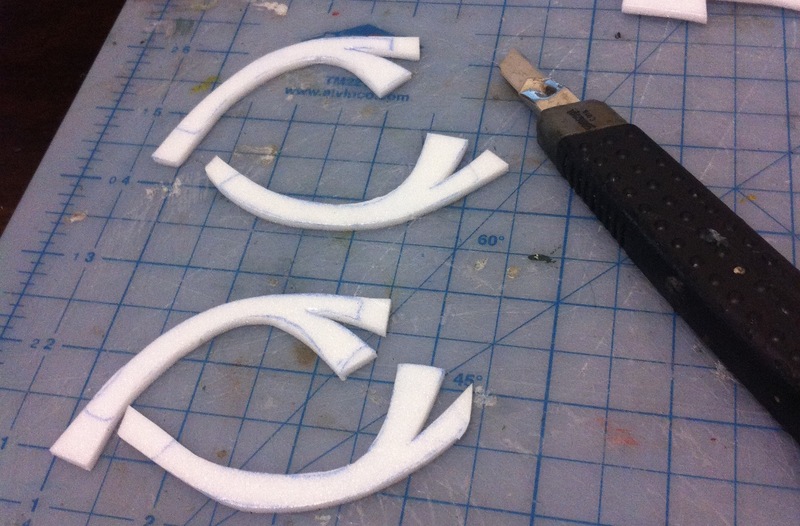 These will be fit together with silicone rubber and other removable attachments. 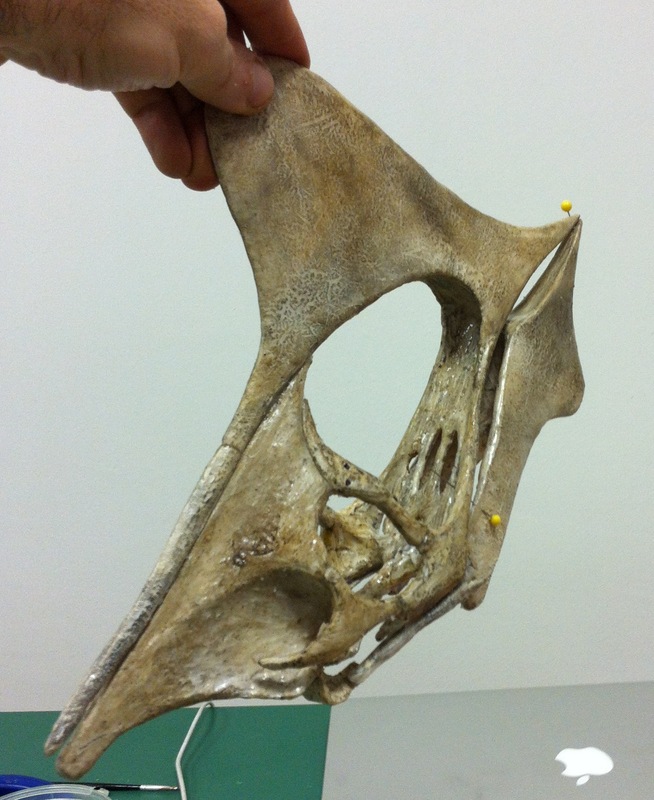 I did not have access to reliable source for the occipital view, squamosal and pterygoid bones, since I hadn’t obtained authorization to see photos of the specimens which could help me with this. 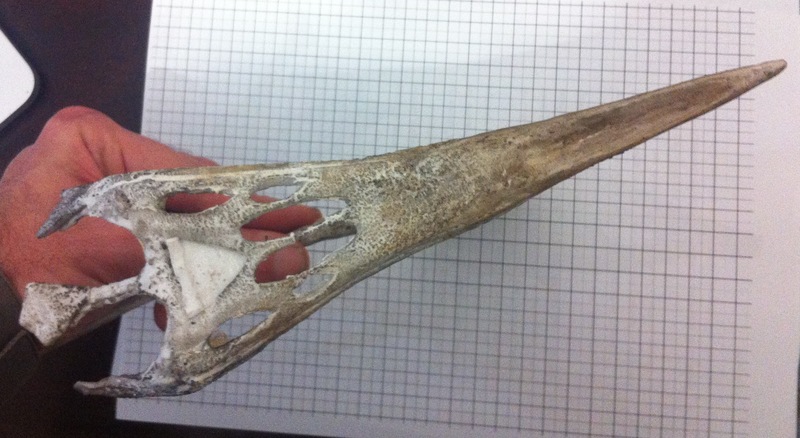 But ten days before my deadline, a paleontologist kindly sent me many more photos from the Tapejara specimen at the Iwaki museum (IMCF 1061). 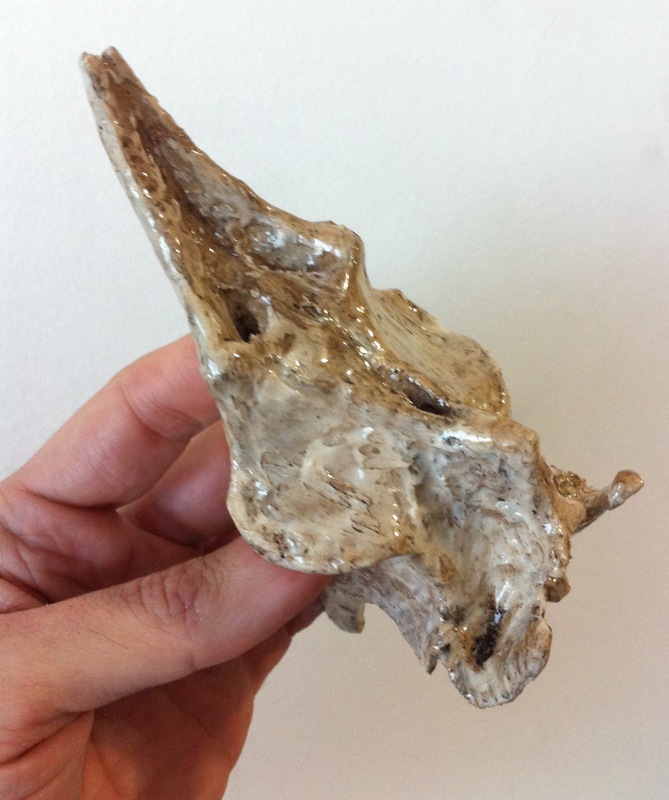 I’m not allowed to show them here, but I did my best to make this Tapejara replica as accurate as possible, so hopefully I captured their details in my sculpture, which you will be able to see here in many different angles. 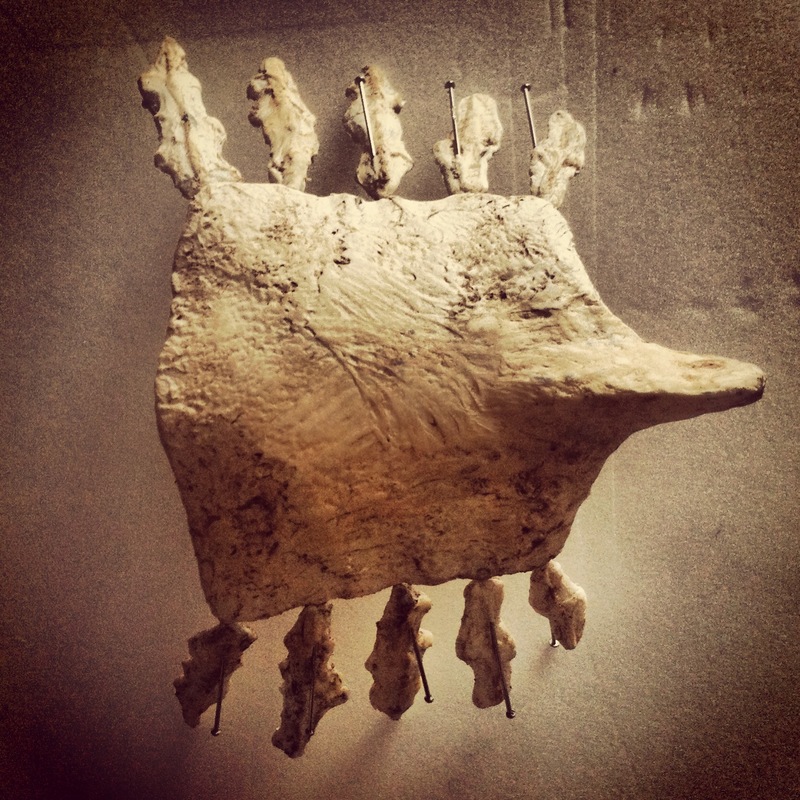 I started with the neurocranium. 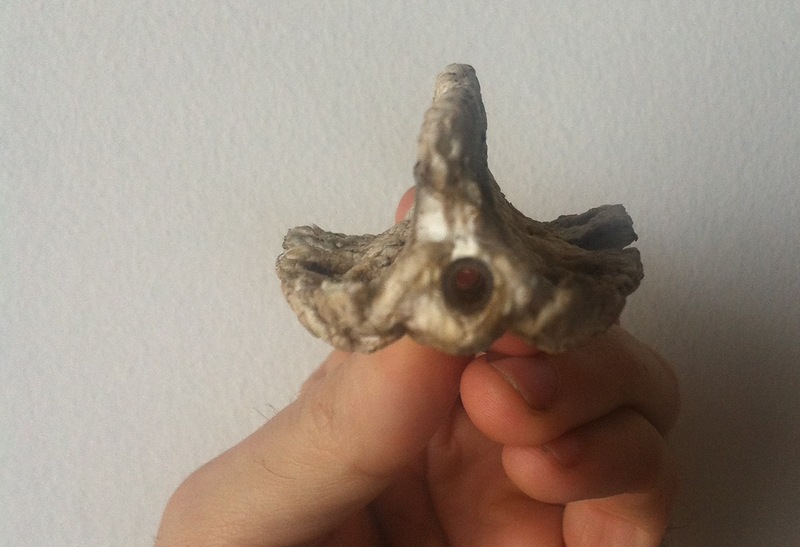 First, I made the occipital crest shorter. It was way too long, and curved up. I cut it short. 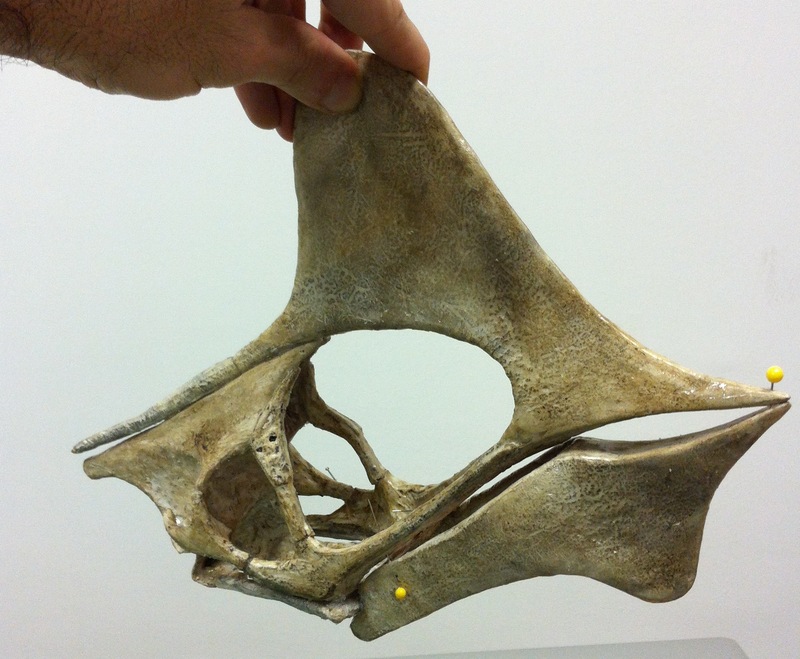 I had initially modeled the neurocranium from the SMNK PAL 1137 specimen, which you can see below. 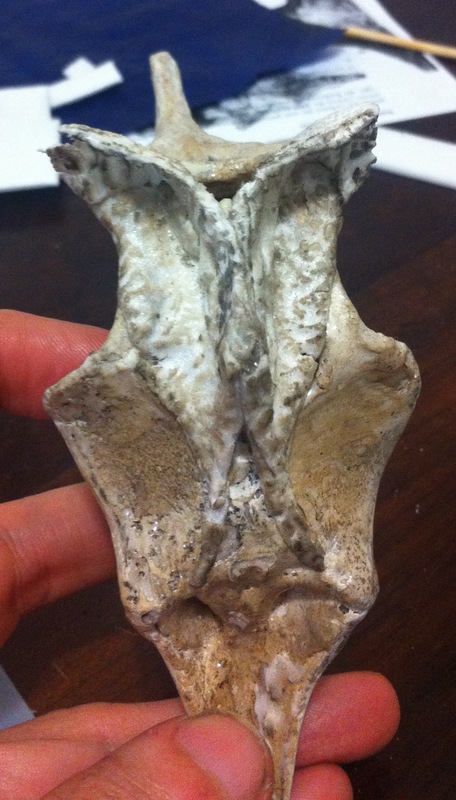 It has a partial occipital bone but it’s too short. 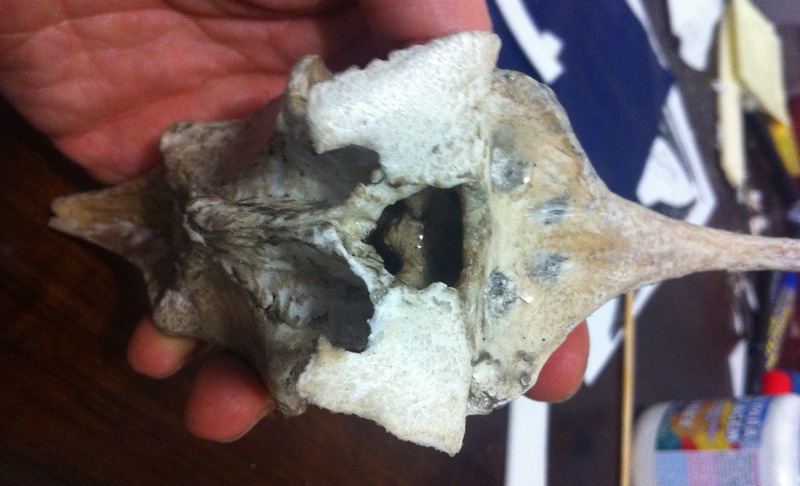 It lacks most of the squamosal and the braincase is open. 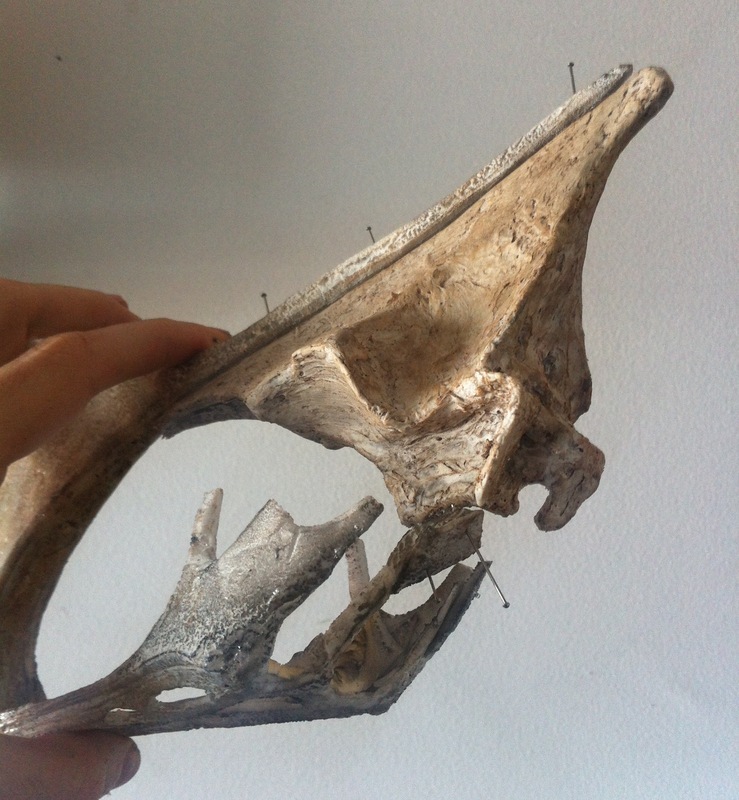 I can connect it to the rest of the skull with postorbital bones, lacrimal, and the parietal crest, but the bones which close the braincase and connect it to the palate (pterygoid, basioccipital, etc.) are missing. 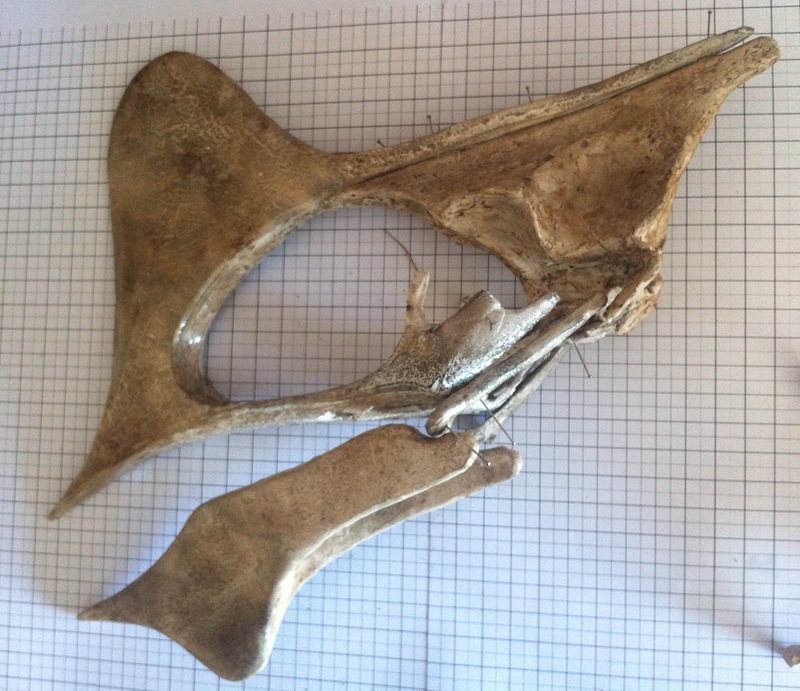 But the IMCF 1061 specimen which has the missing bones will hide it. 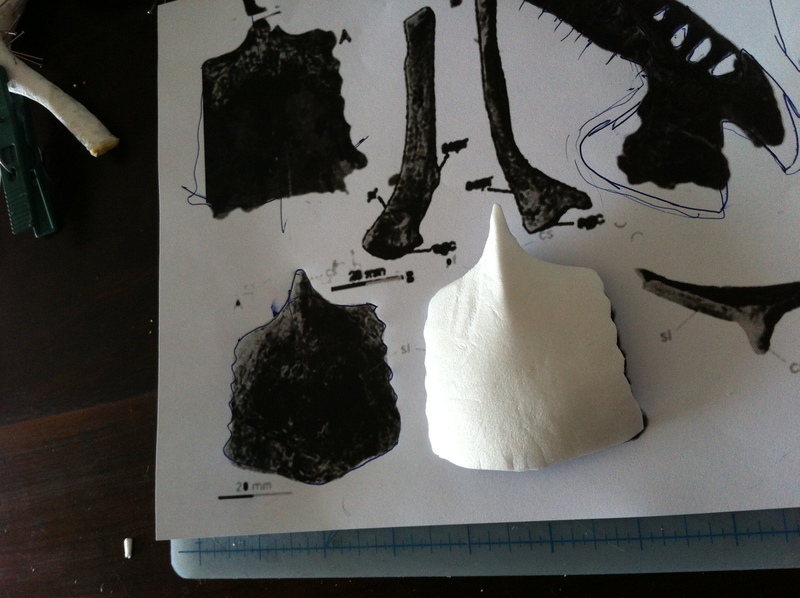 I started with two sheets of foam, glued and pinned around the edges of the braincase. 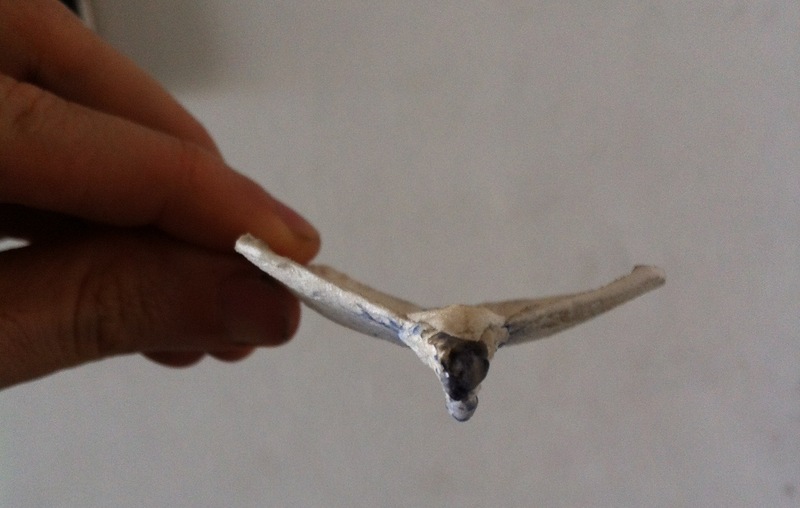 I modeled it with a lighter to shape the bones (I don’t actually know the name of this bone – it might be pterygoid, epipterygoid, basioccipital… my anatomical reference guides do not include a pterosaur). 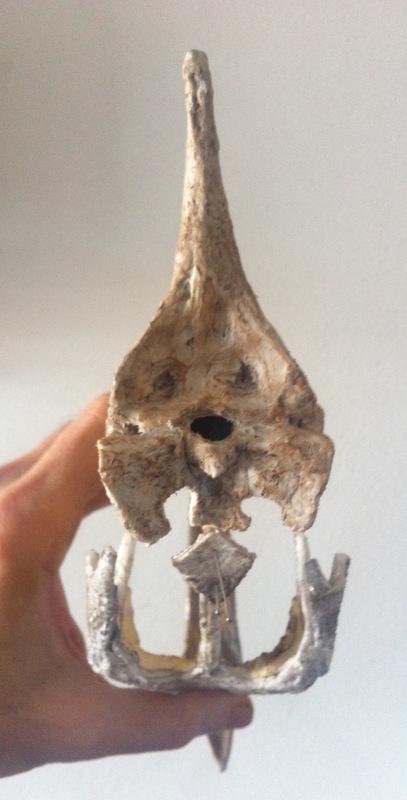 Then I shaped a little more, practically closed the braincase leaving only a small hole at the back (foramen magnum) but still no occipital condyle. 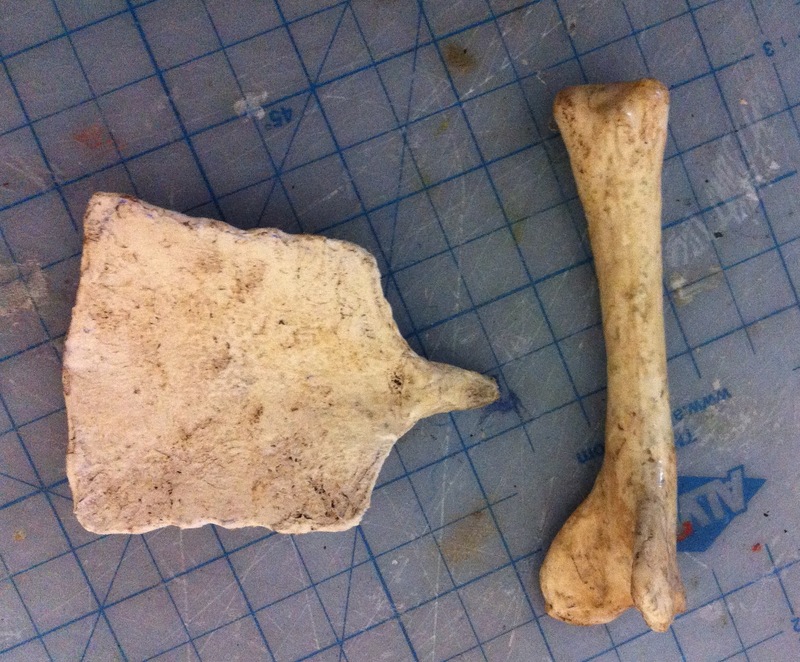 I also shaped the curvy squamosal bones. 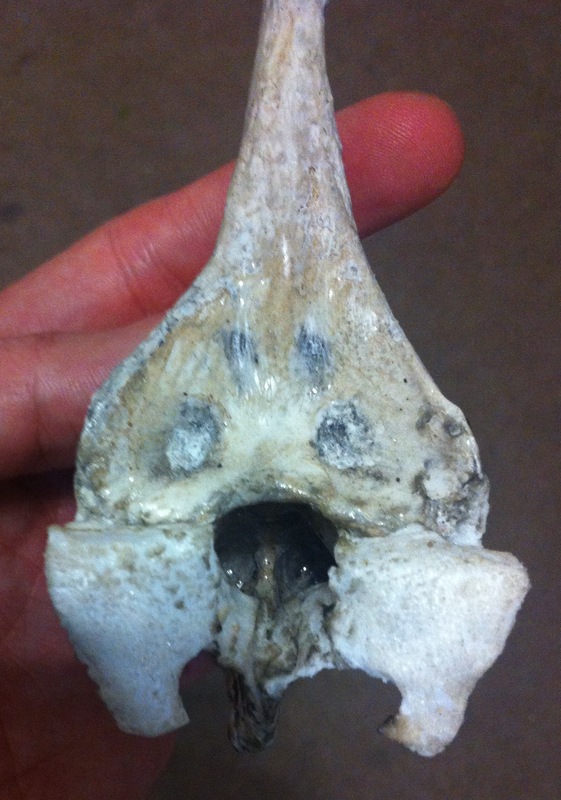 You can still see the braincase if you look through foramen magnum. Maybe I should have placed a little Tapejara brain there before closing. 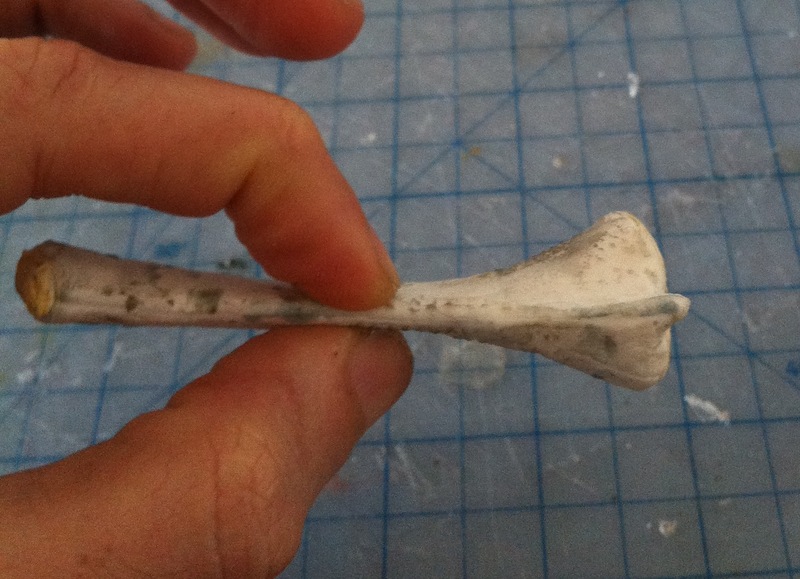 Here I also attached the mandible and the quadrate bones (the small squares are 5mm wide). 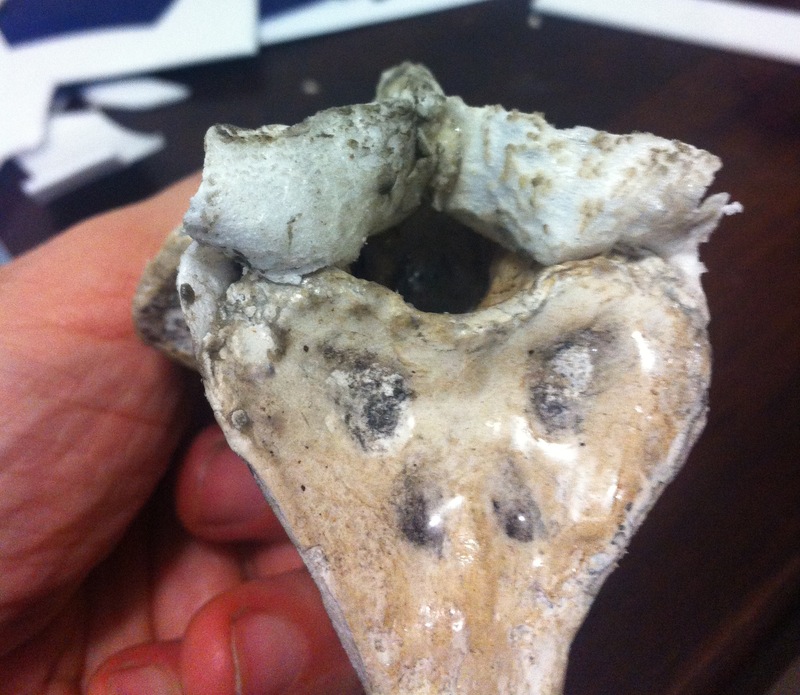 I finished the neurocranium with a layer of epoxy resin, for protection and strength. 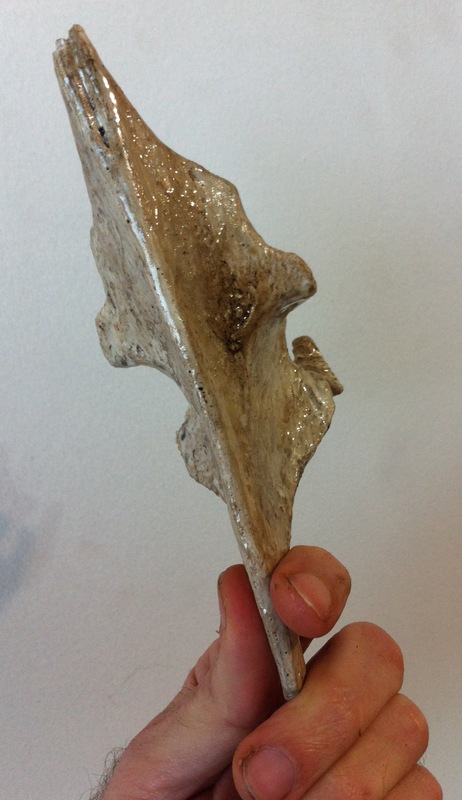 Since it’s shiny it doesn’t look much like a bone anymore, but it looks a lot like a piece of granite. I will later add layer of matte varnish. 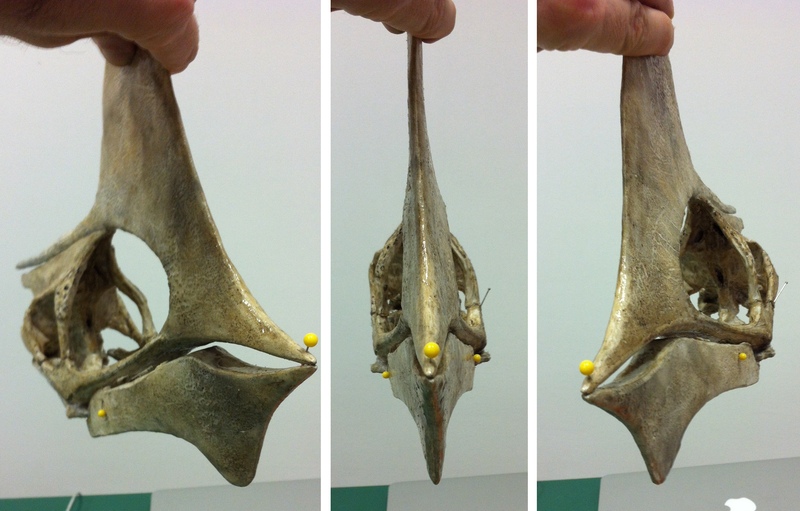 If you have access to photos of the neurocranium of the IMCF 1061 specimen, you can compare them with these. 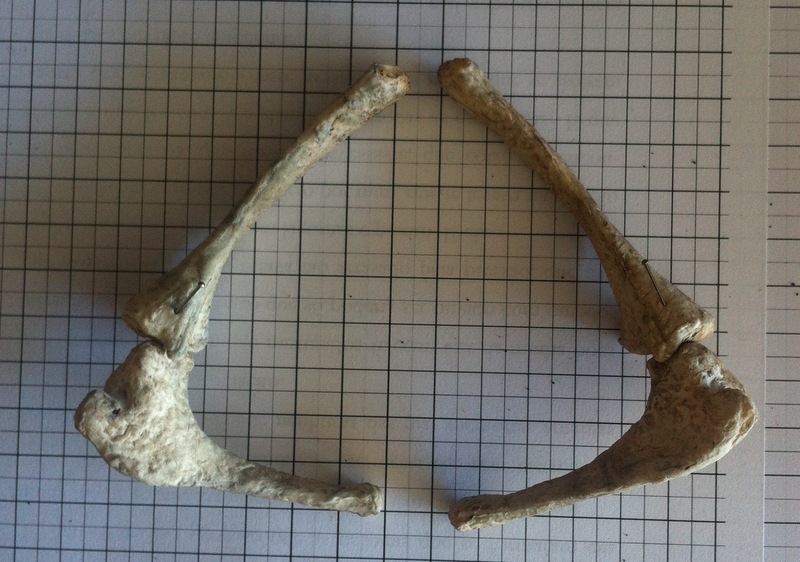 None of the Tapejara specimens I used as sources had a tail, so I used as a source Anhanguera piscator, which seems to be the most closely related pterosaur with well preserved caudal vertebrae. 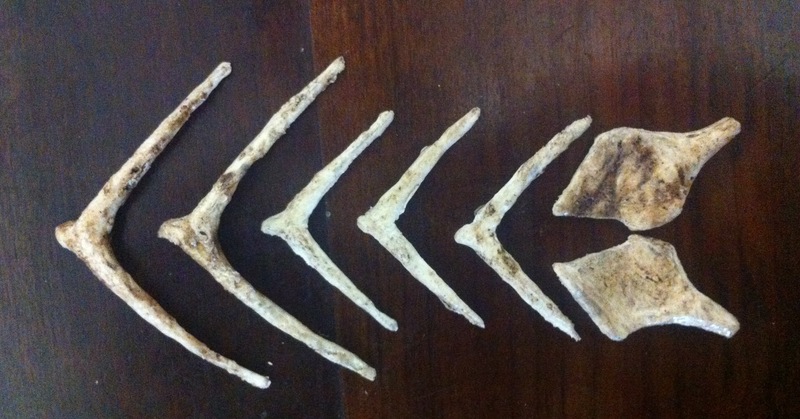 The source is Kellner & Tomida 2000, but I used photos of the tail I had made for Tupuxuara and scaled it to Tapejara proportions. 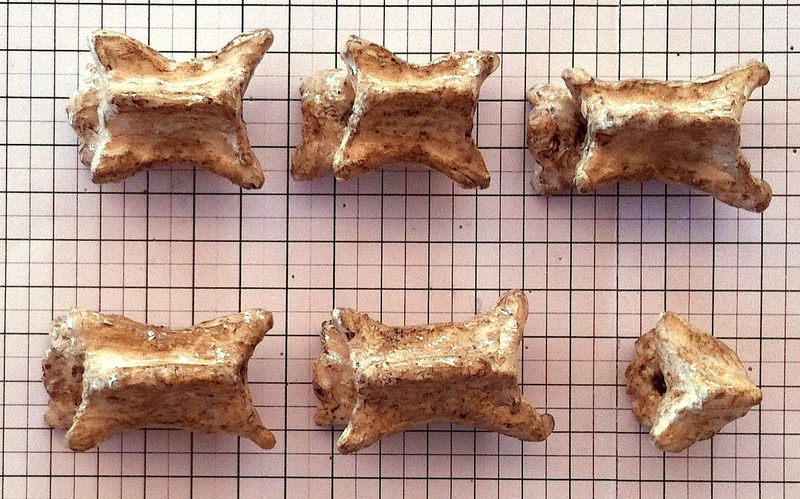 I made ten individual caudal vertebrae. 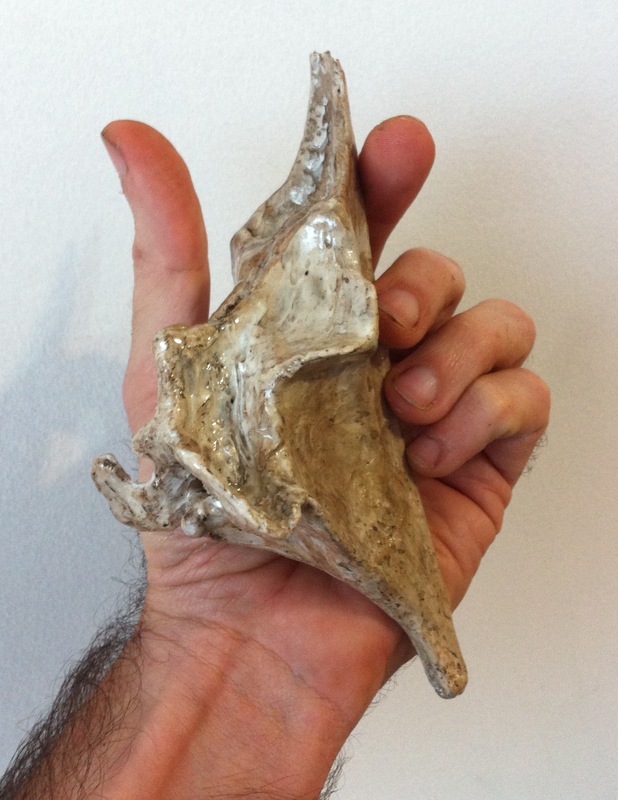 This number is speculative, as is the shape of the last caudal vertebra. 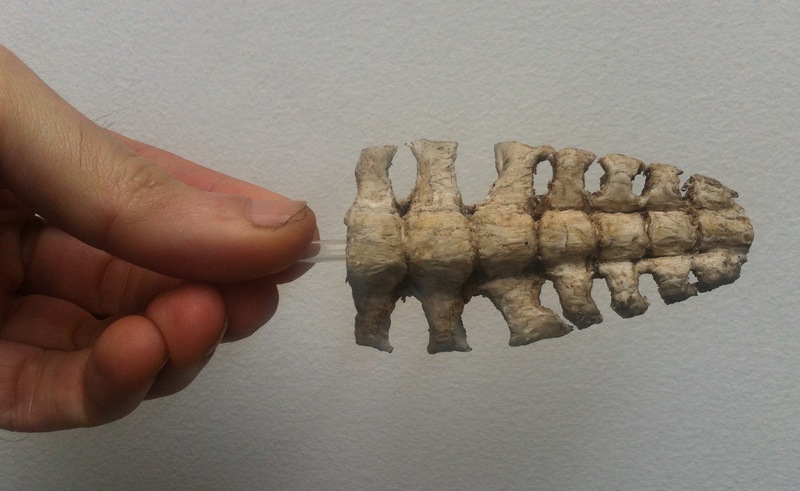 Anhanguera’s tail has dorsally projecting processes on the first four or five vertebrae, which change to lower anterodorsally projecting ones which get smaller and smaller as you get closer to the end of the tail. Here are some photos. 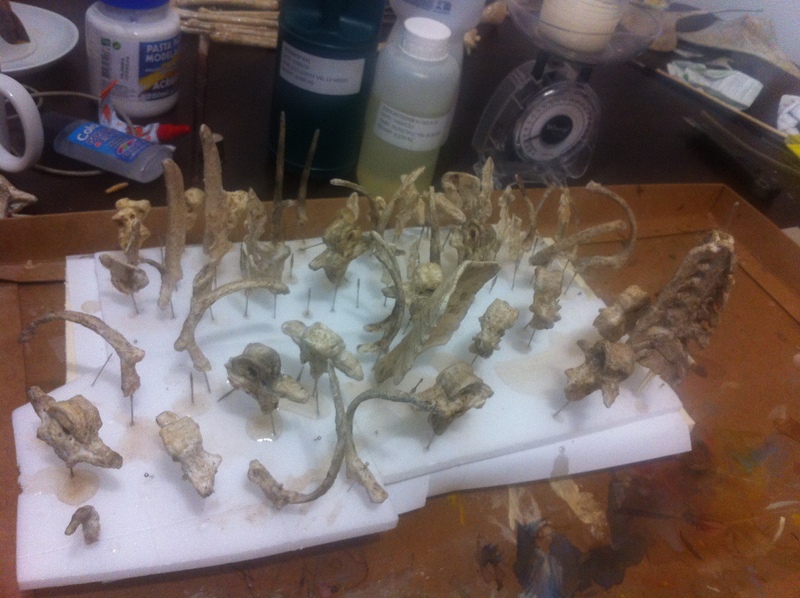 Yes, I made all the vertebrae hollow except for the last one. 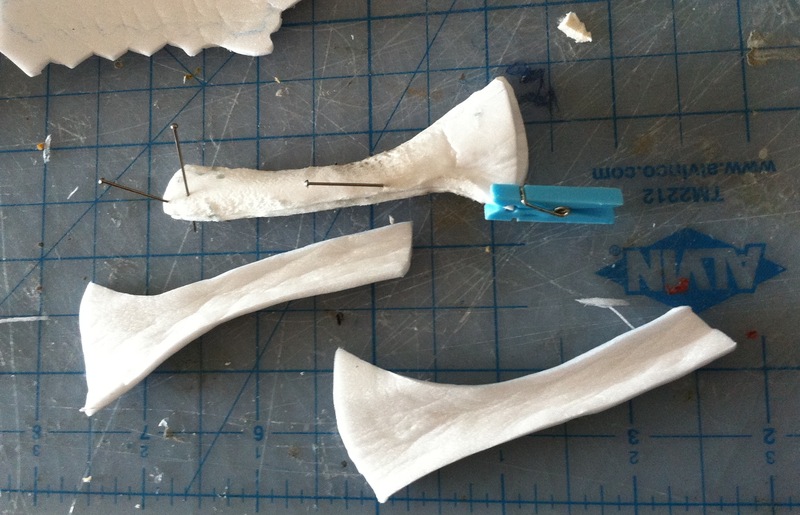 I thinned the foam a bit with fire. 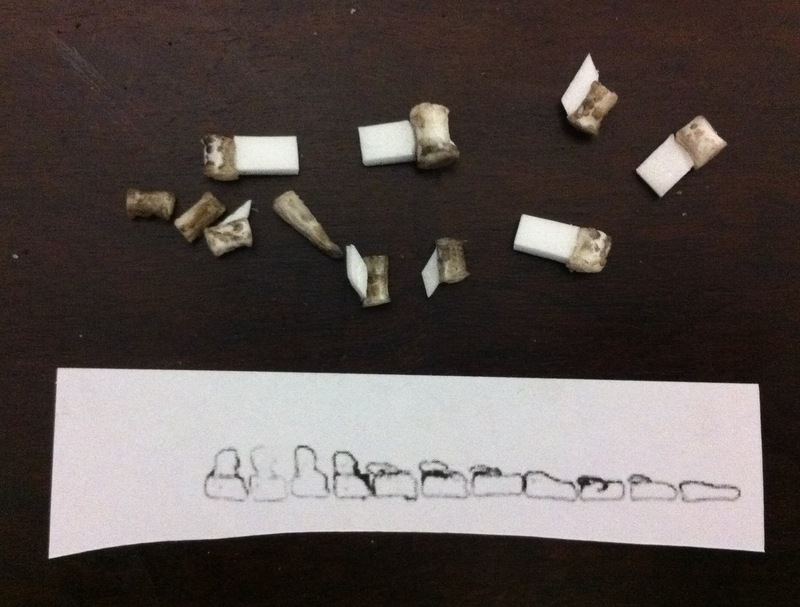 These are the final vertebrae. 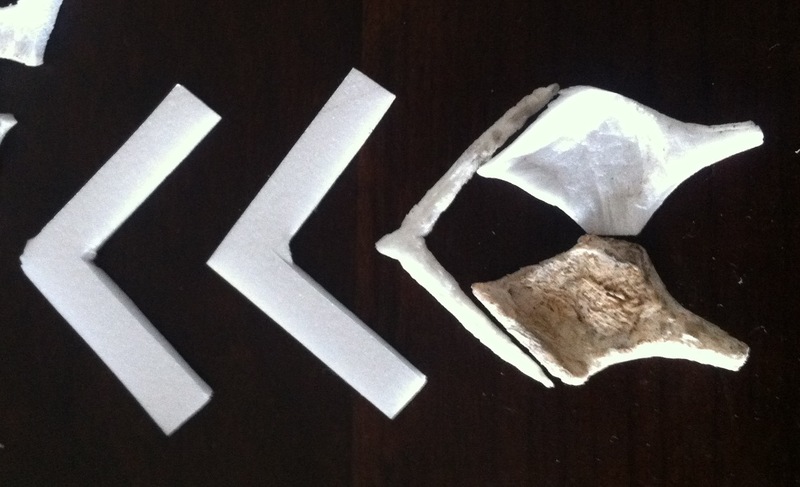 Here is the pre-pubis I cut out of a 2mm sheet of foam, based on the MN 6588-V specimen. 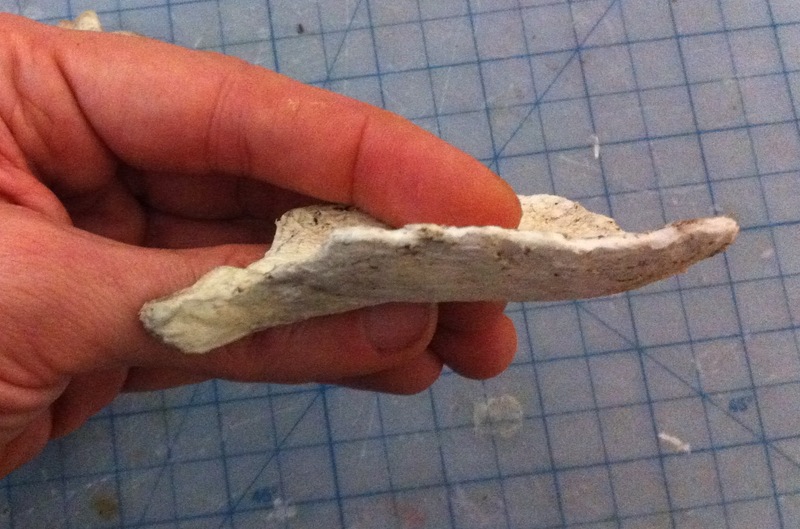 I made gastralia from pieces of foam like this. 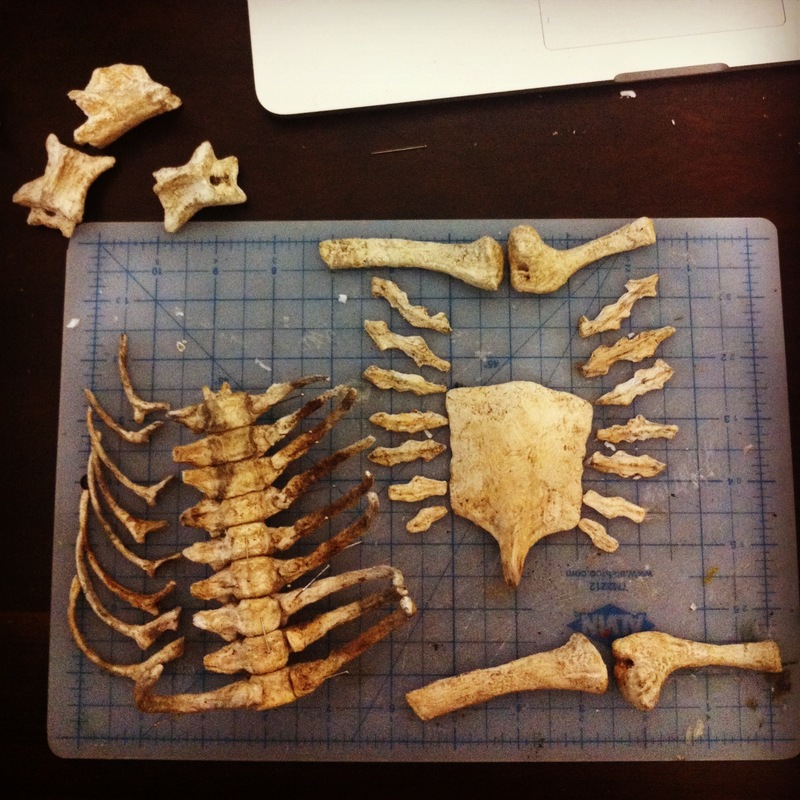 I already had made the pelvic bones, but the sternum complex was missing. 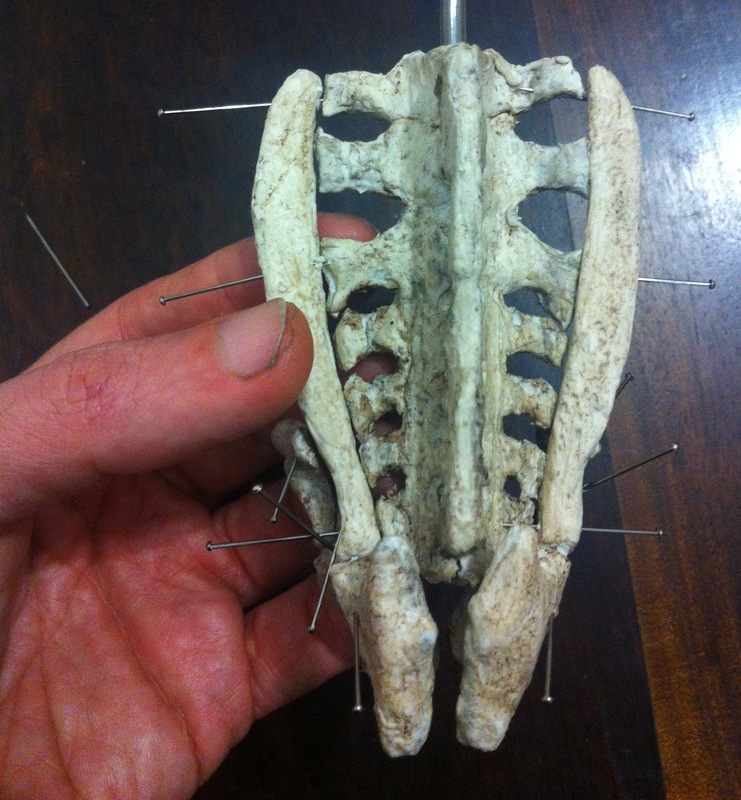 I didn’t find any realiable source with a perfect sternum, so I used as a source the same azhdarchoid sternum that I used in Tupuxuara, and adjusted it so it would fit the Tapejara pelvis (from SMNK PAL 1137). 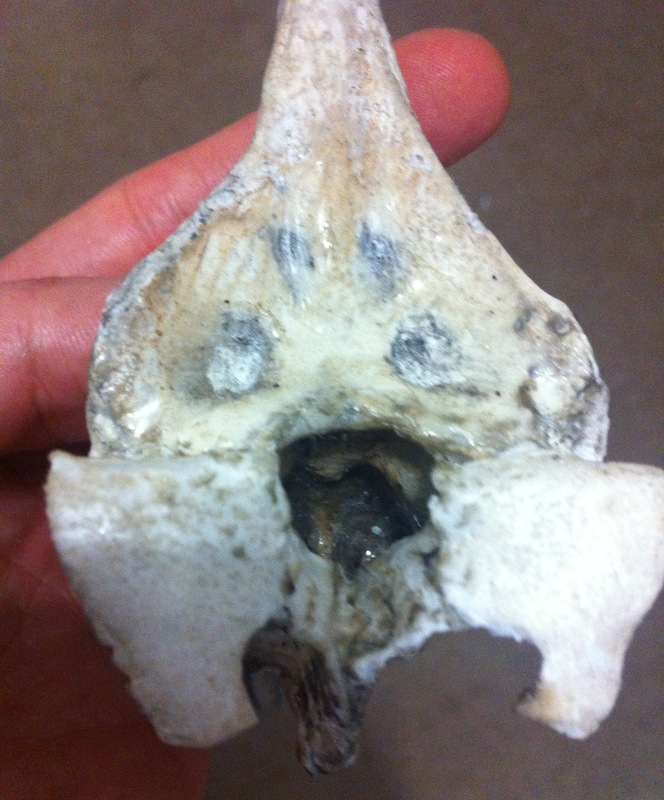 They are 5 sacral vertebrae, and two dorsal ones with lateral processes fused to the preacetabular processes of the ilium. 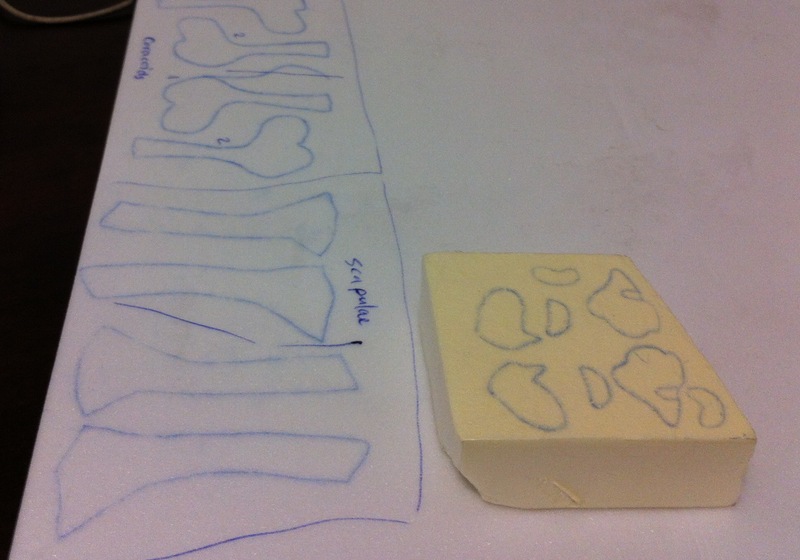 I cut it out in one piece from a sheet of 2mm foam, and added the stacked vertebral bodies sculpted out of thicker (yellow) foam. 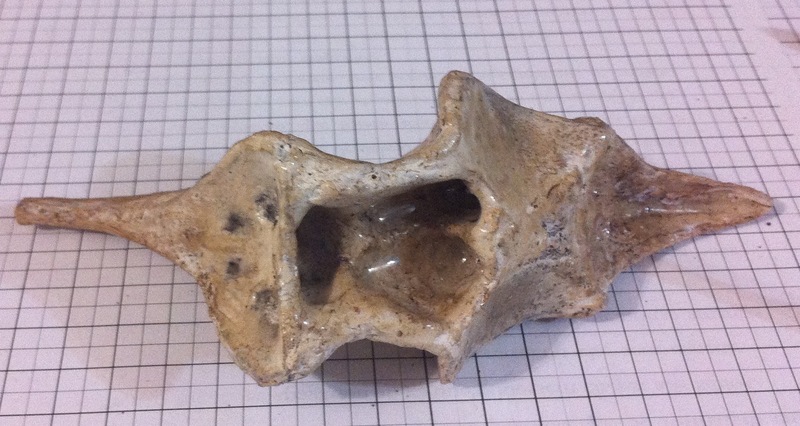 Here are two views of the sacrum after treating with fire. 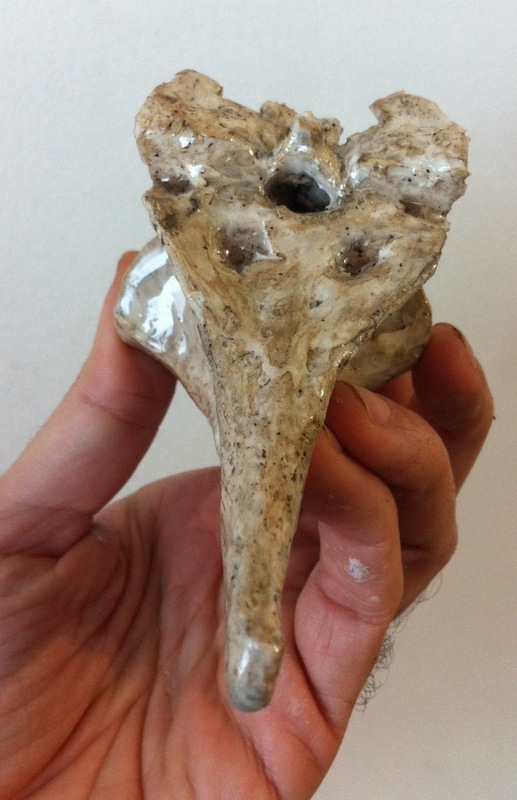 Four views of the finished sacrum. 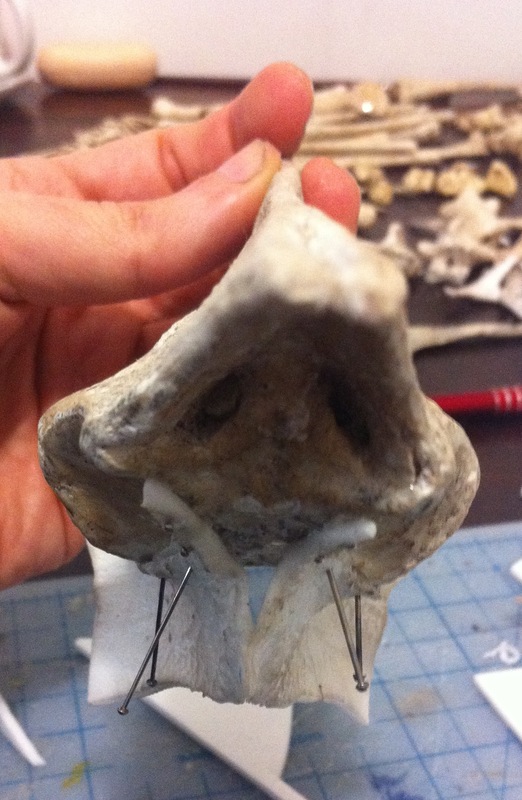 Next step: assemble the pectoral girdle. I now have all the parts. 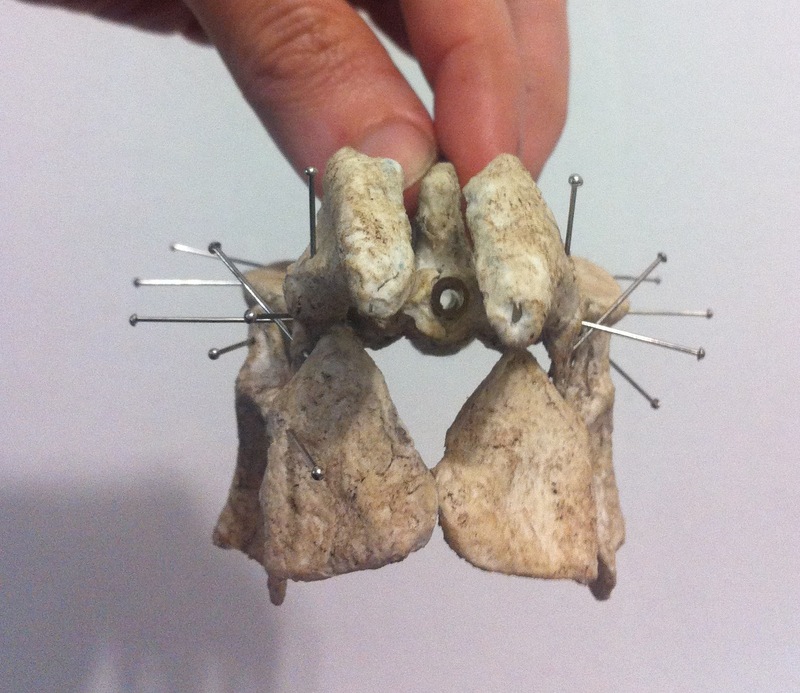 I wish I had smaller pins. 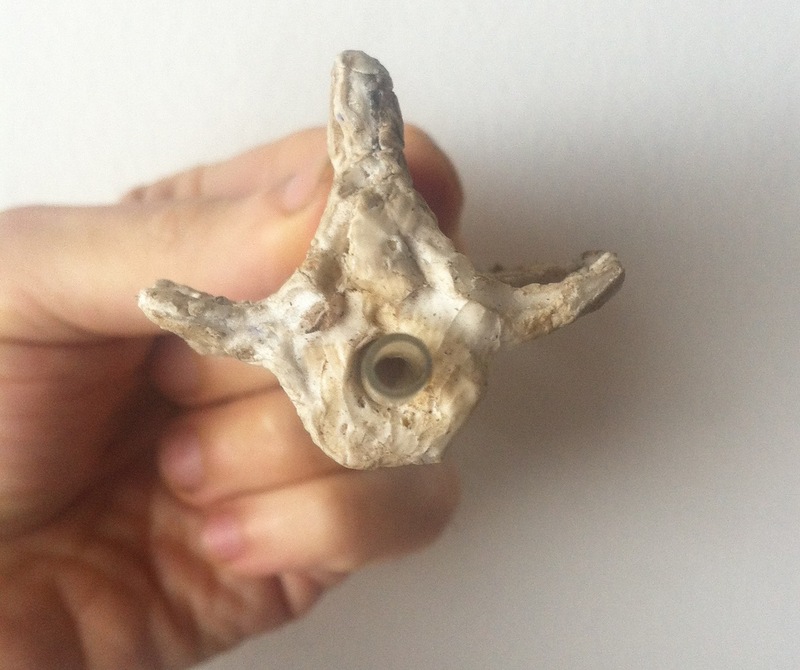 I placed a rubber tube through the vertebrae acting as a spinal cord. 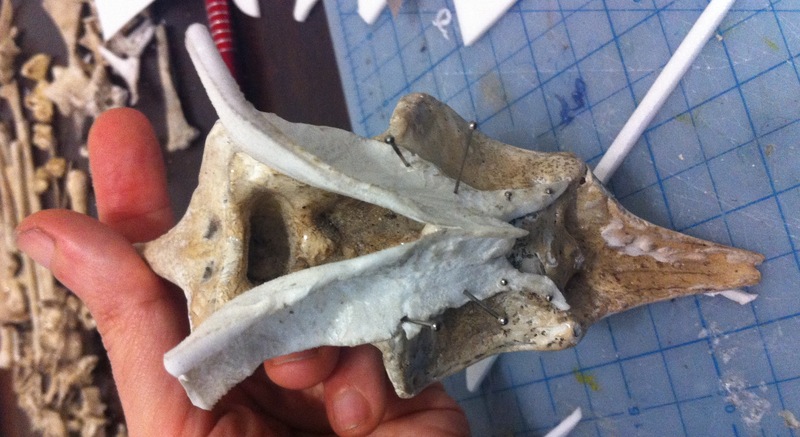 It will be used to attach the pelvic girdle to the dorsal spine and to attach the tail on the other side. I now can test all the connections. 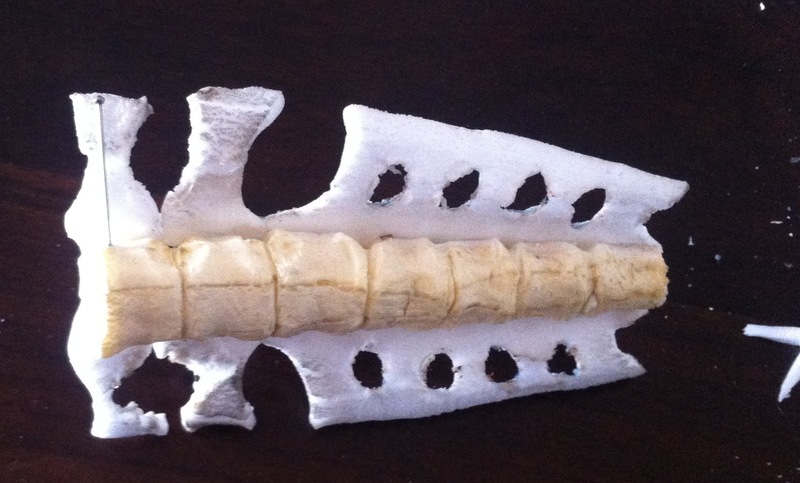 Here is the Tapejara dressed in its pelvic girdle. 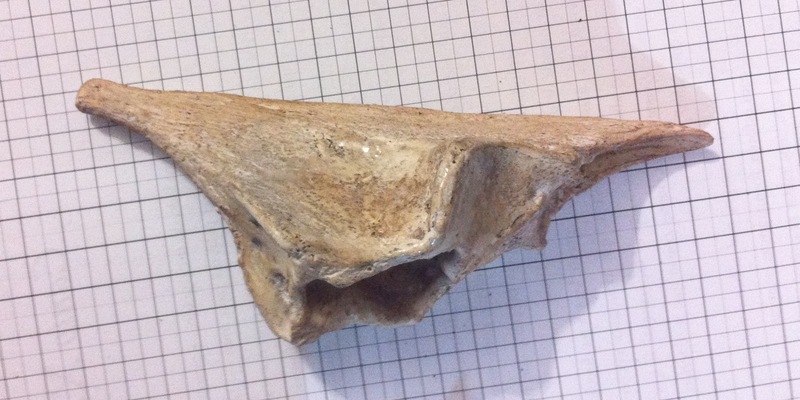 And a ventral one. It’s almost finished. 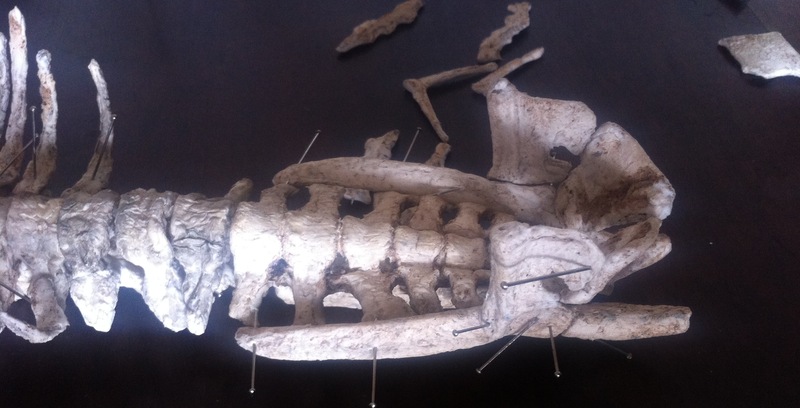 I’m already prototyping the pre-pubis and gastralia, but before I assemble the rest I will cover what I have so far with epoxi resin (I can’t use pins anymore). 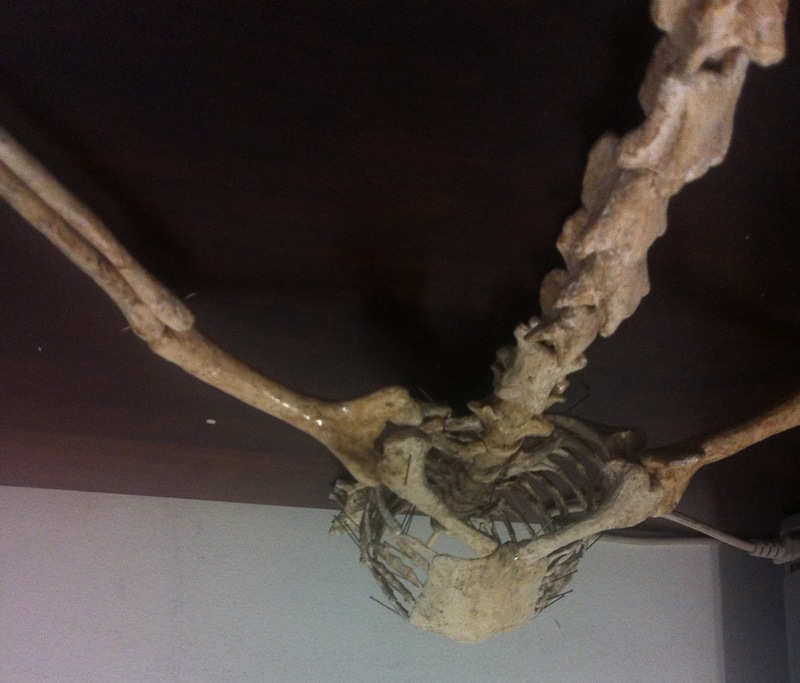 The pectoral girdle consists of scapula, coracoid, sternum, dorsal vertebrae and ribs that grow from the vertebrae and from the sternum. 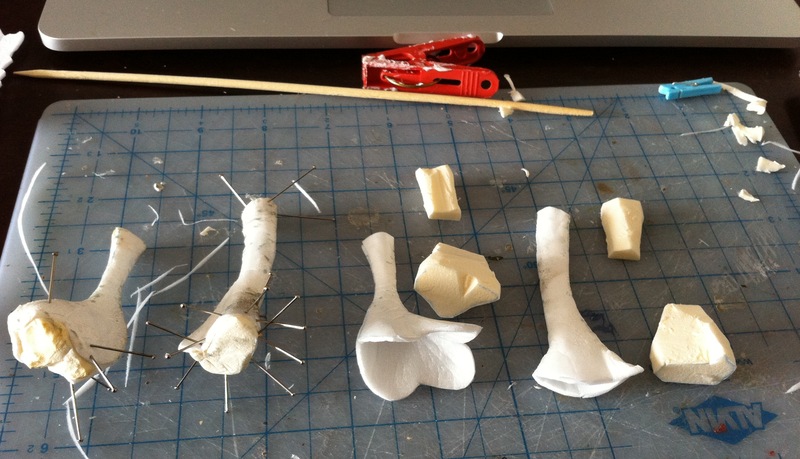 I’m still having trouble figuring out how to assemble the scapula and coracoid. 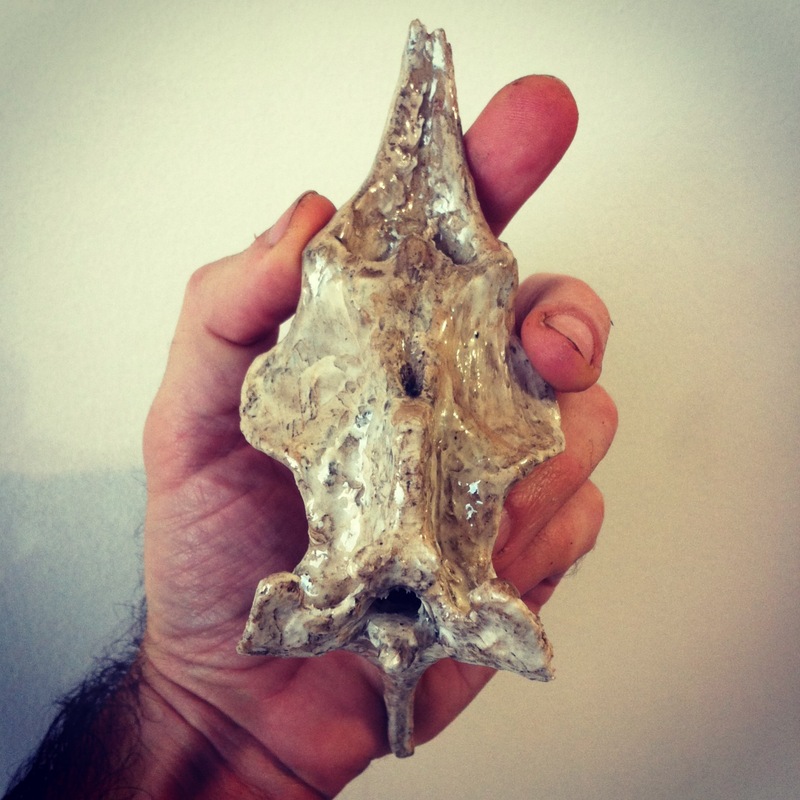 I read some articles and I haven’t discovered yet what most paleontologists think is the best layout. They seem to disagree in many aspects. 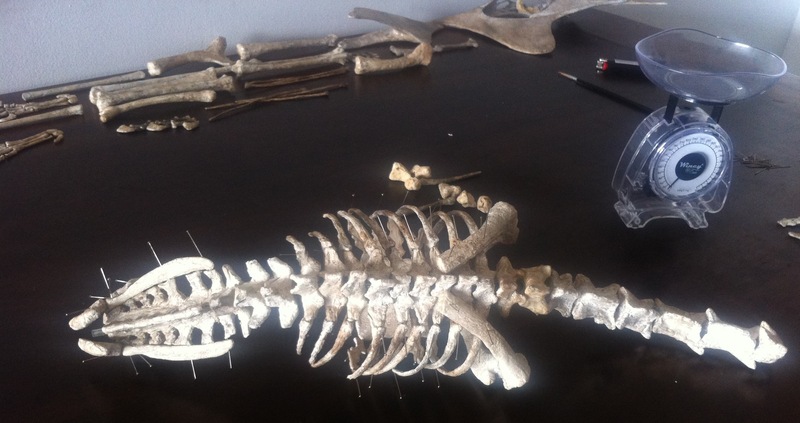 Without twisting the bones quite a bit or setting the scapula to articulate with the first two dorsals I can’t obtain a low position. 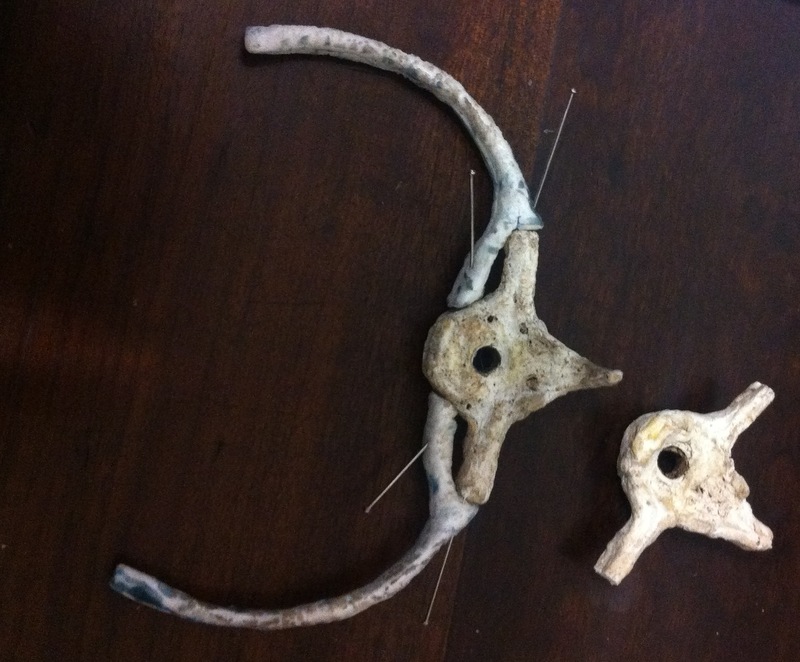 At best, the glenoid will stay somewhere in the middle of the chest. 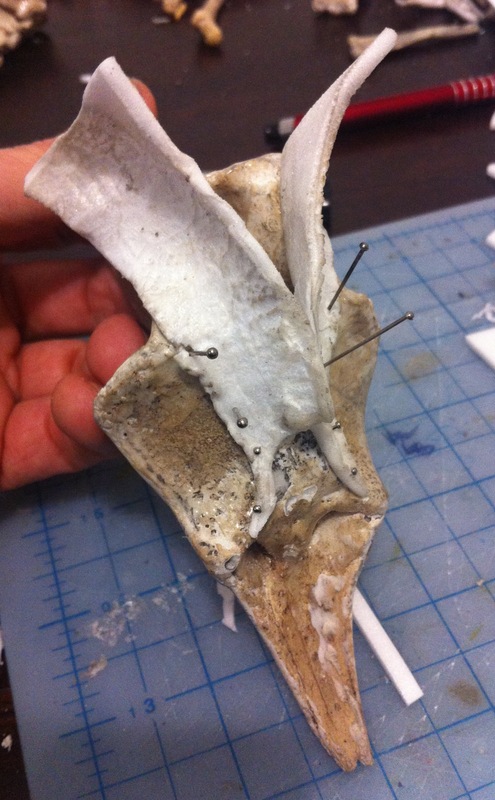 For now, I just pinned the proximal end of the scapula to the third dorsa, and the distal end of the coracoid to the sternum, so I could work on the rest of the pectoral girdle. 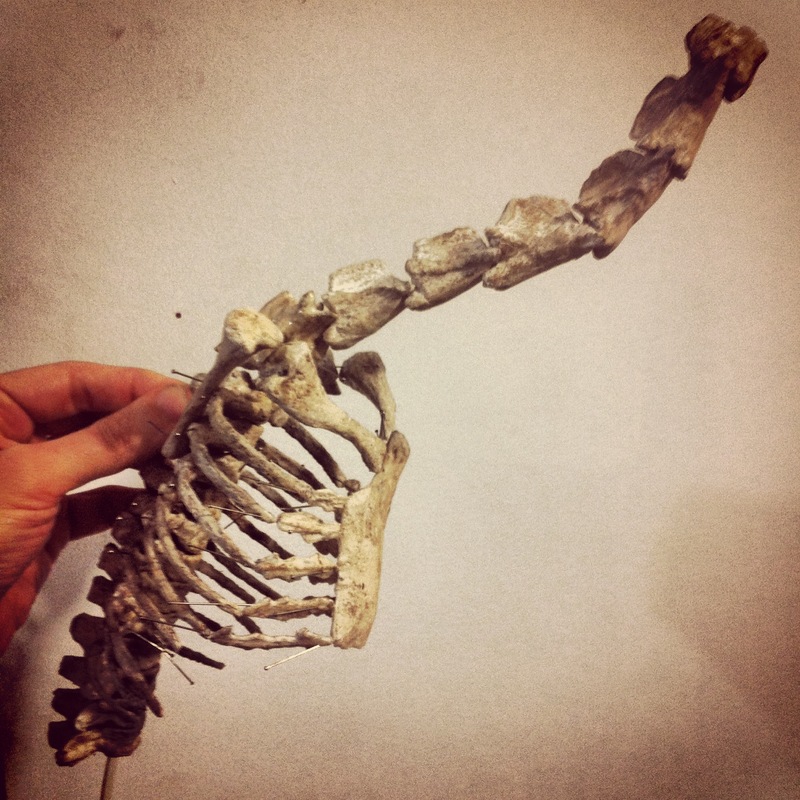 But the correct way to connect scapula and coracoid is still an issue I haven’t resolved. Any help is welcome. 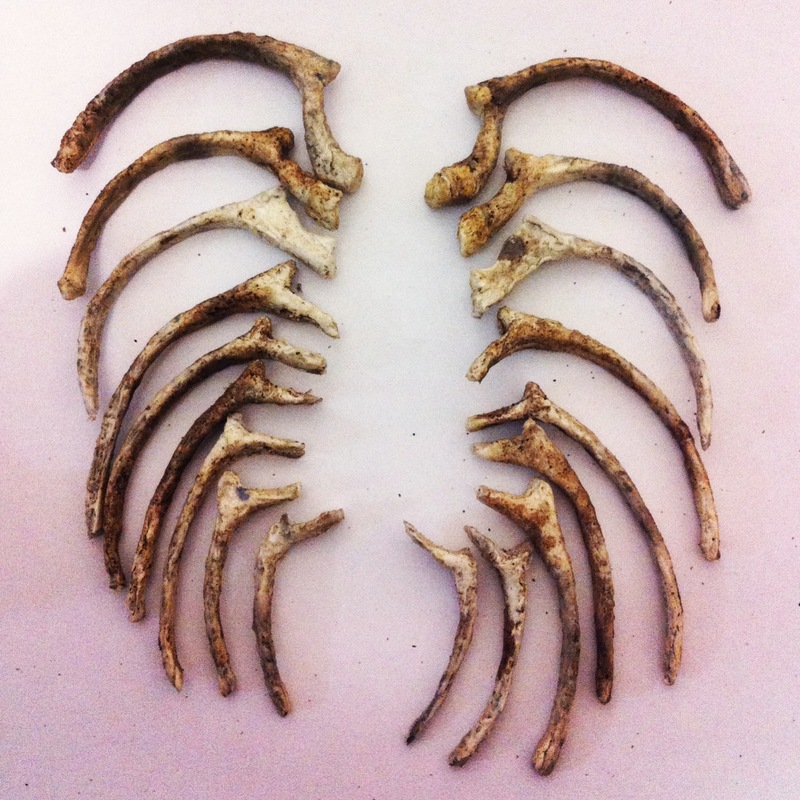 The ribs. 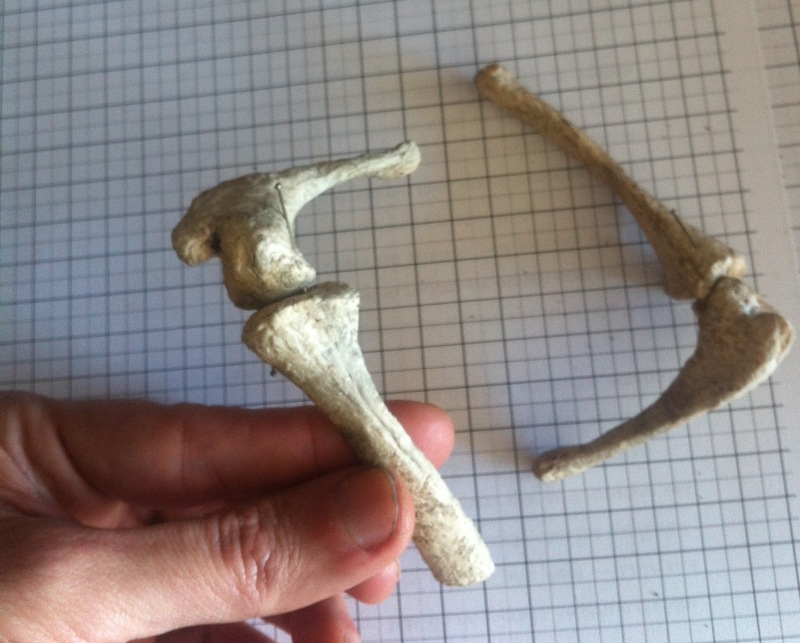 I found some random ribs in fossils, but I preferred to use Wellnhofer’s reconstruction of Pteranodon as a reference to start with. I scaled them for Tapejara and made these sketches. I cut out the two first pairs. I made them hollow of course. 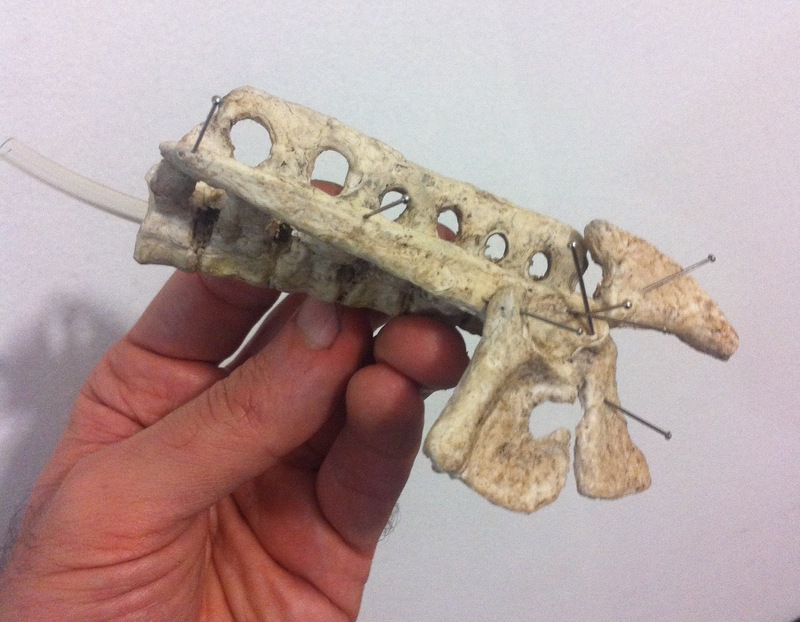 This is a first prototype attached to the first dorsal vertebra. 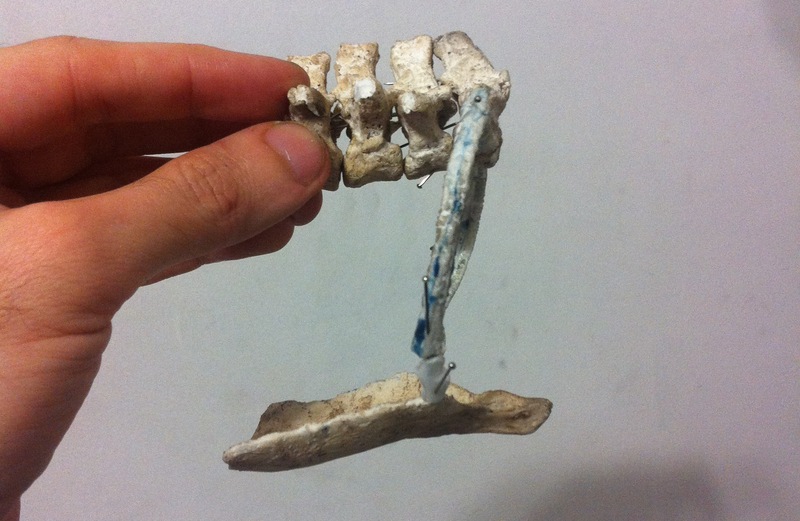 I quickly made some (generic) sternal ribs and connected their ends to the sternum and larger ribs to test the shape of the rib cage. Time to make more ribs. 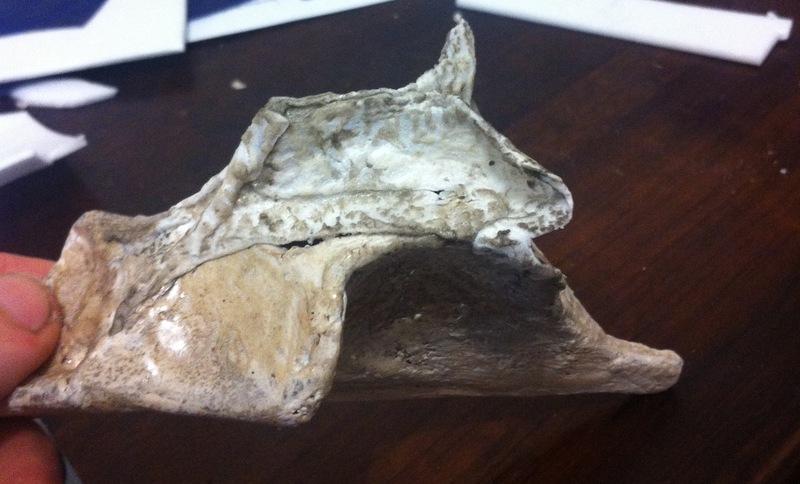 The sternal ribs are thin but they have some lateral very thin bone pieces projecting laterally. 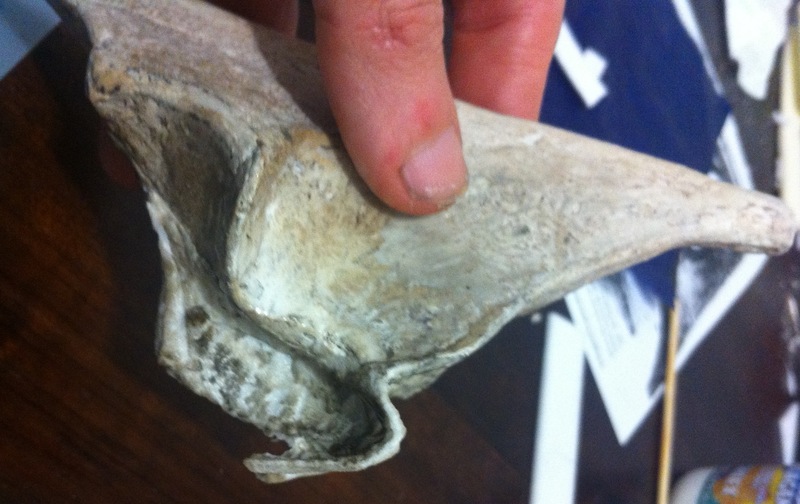 It looks like some kind of ossified cartilage. 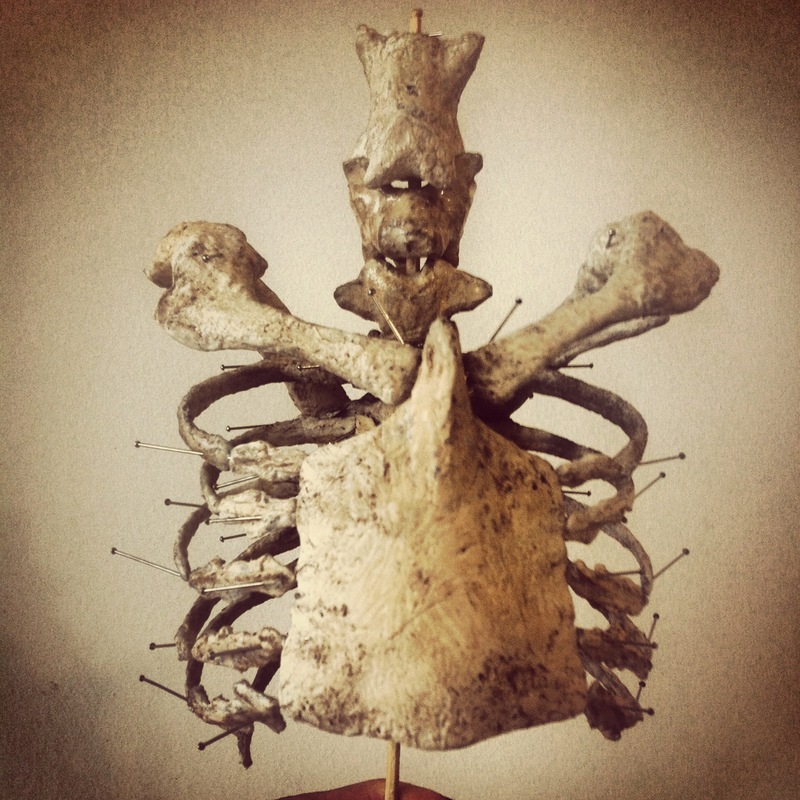 How many ribs should be connected to the sternum? Some say seven lateral pairs, many reconstructions show four or five. 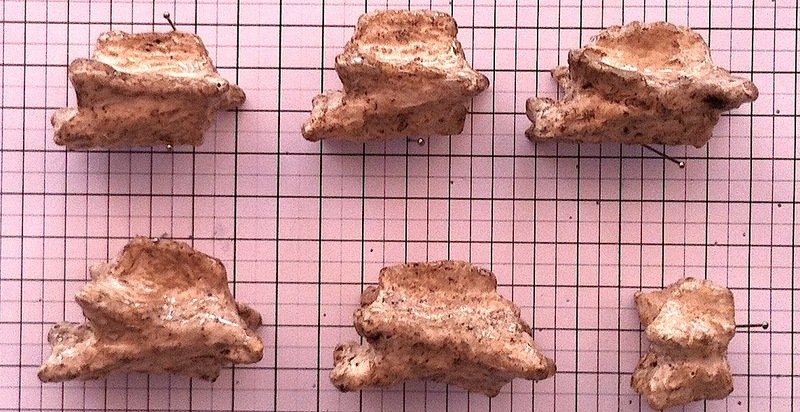 The azhdarchoid MN-6588-V seems to have seven, and probably two more pairs behind. I chose five. 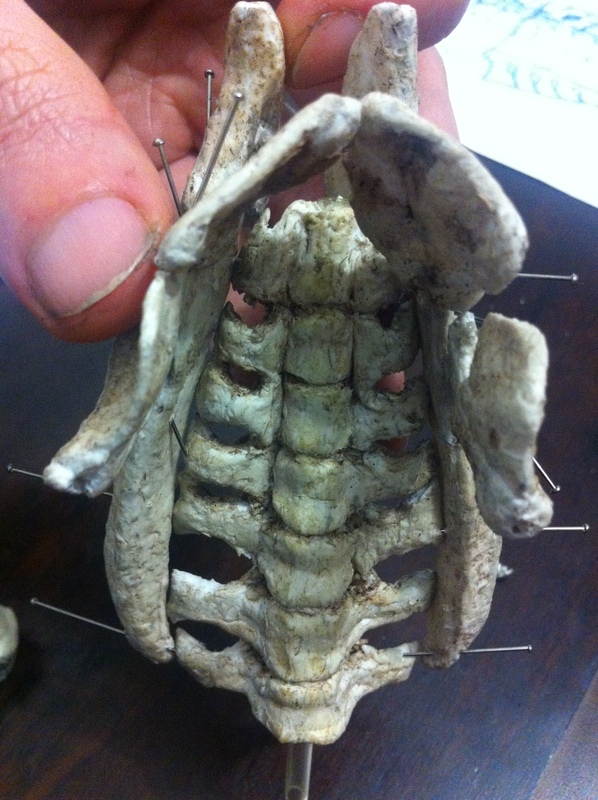 Now the challenging attempt to assemble the pectoral girdle. 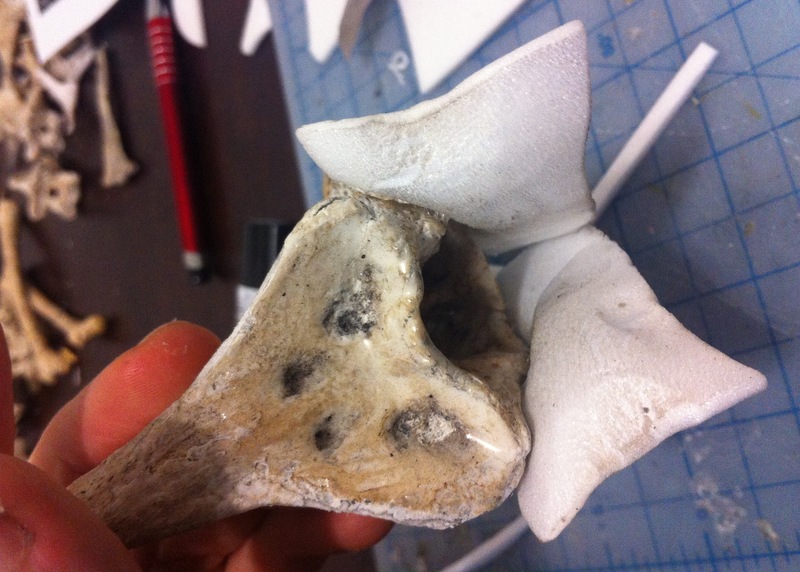 Somehow I fitted the scapula and coracoid in a way that revealed a glenoid and didn’t seem weird. 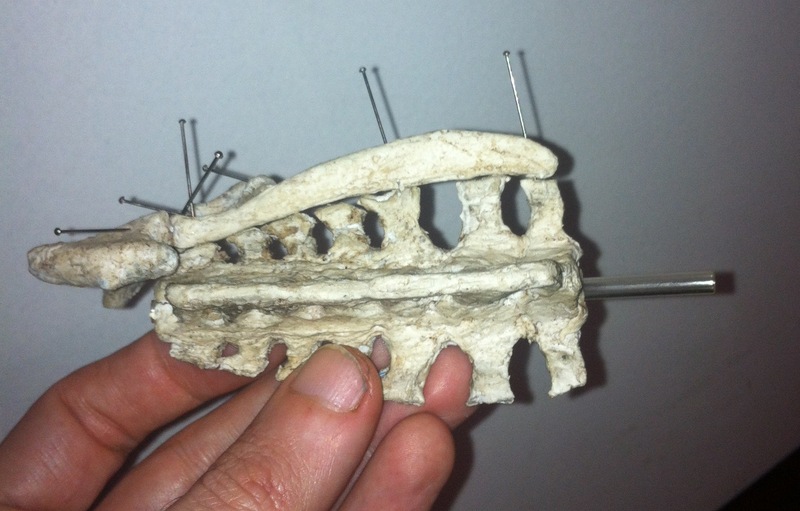 The proximal end of the scapula is pinned to the third dorsal vertebra. 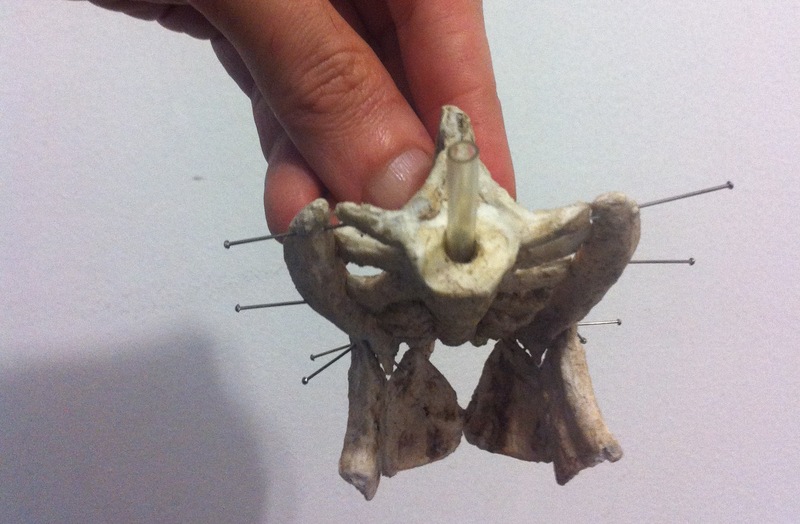 If I project it a bit more laterally, it can move back more, but the sternum-coracoid articulation will also change. 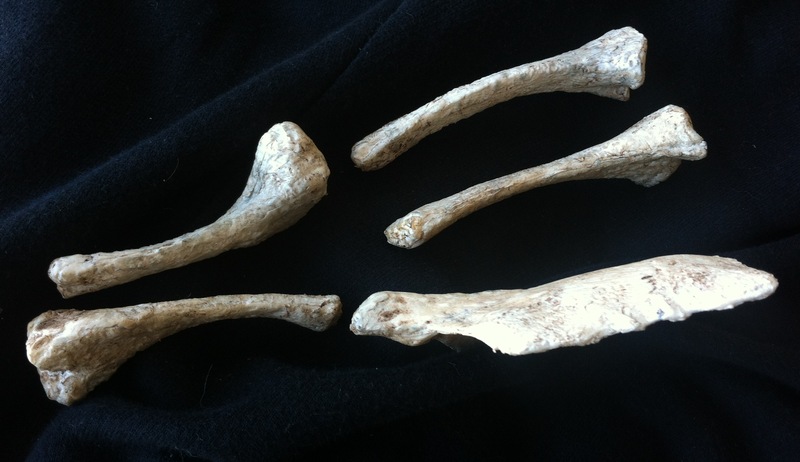 I had two sources for the scapula and coracoid, and three for the sternum. 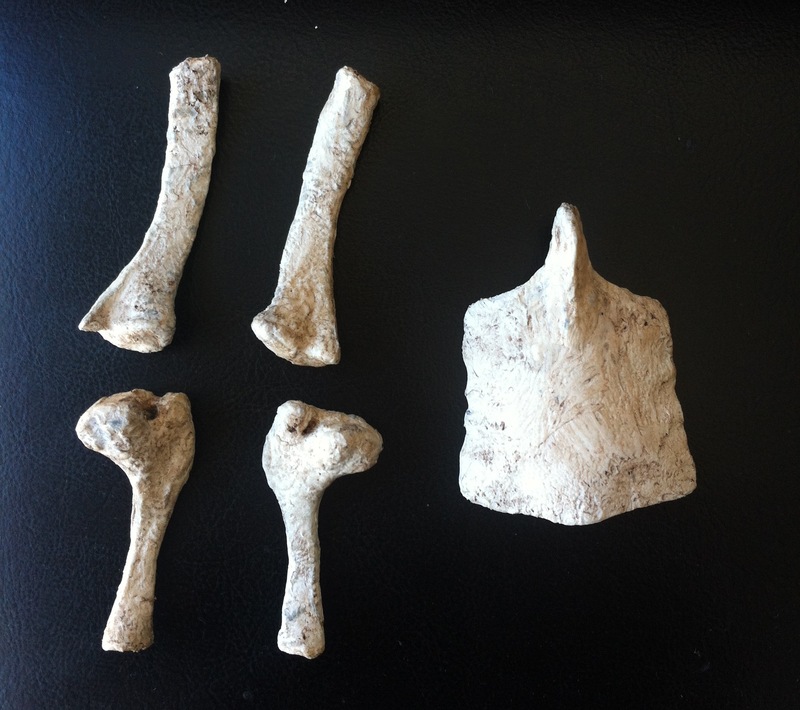 For the scapula and coracoid I initially used SMNK PAL 1137 but then received better photos from IMCF 1061. 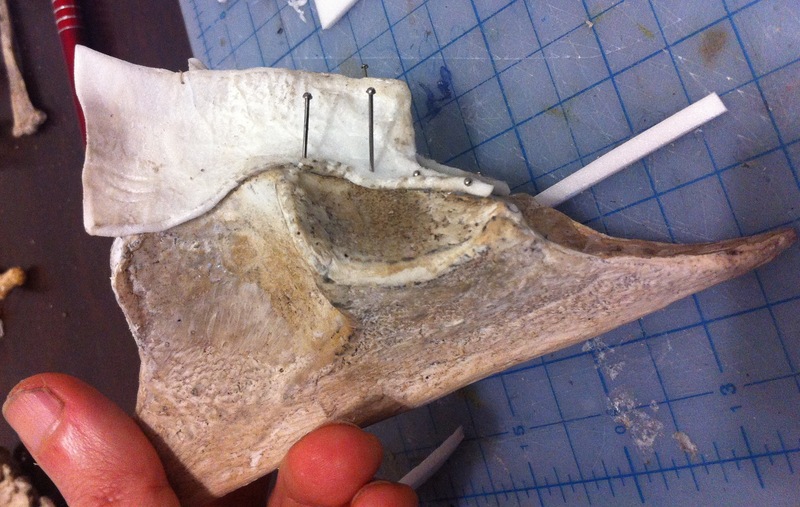 The scapulae looked alike, but the proximal end of the coracoid was very different, it was also much longer. 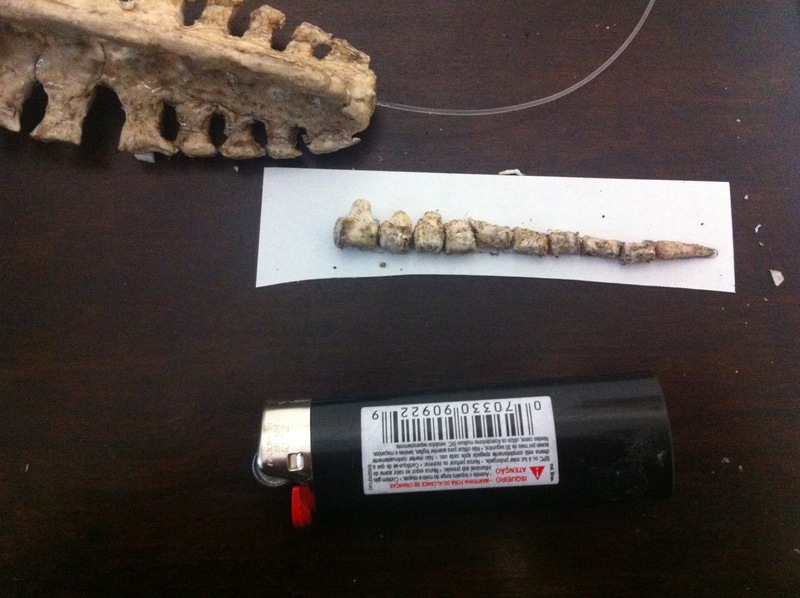 I don’t know if any part is missing or if it is just a result of SMNK PAL 1137 representing a very young specimen. Anyway, it is still very hard to identify and compare certain details when one photo is a bad black and white one with only two views. 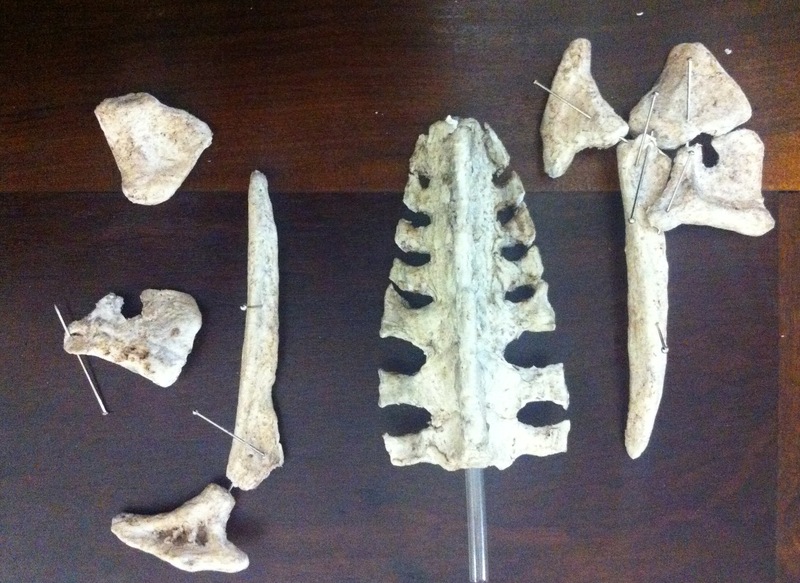 I decided to make the scapula and coracoid from IMCF 1061, and the sternum from SMNK PAL 1137 scaled by SMNK PAL 3985. 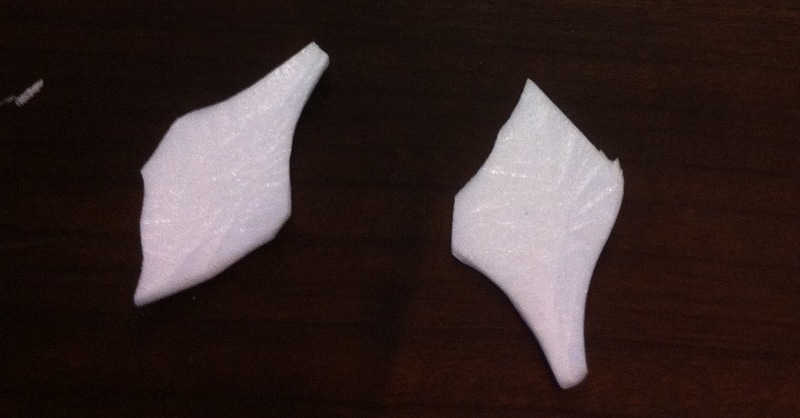 After estimating widths and depths from the photos, these are the flat parts I came up with. 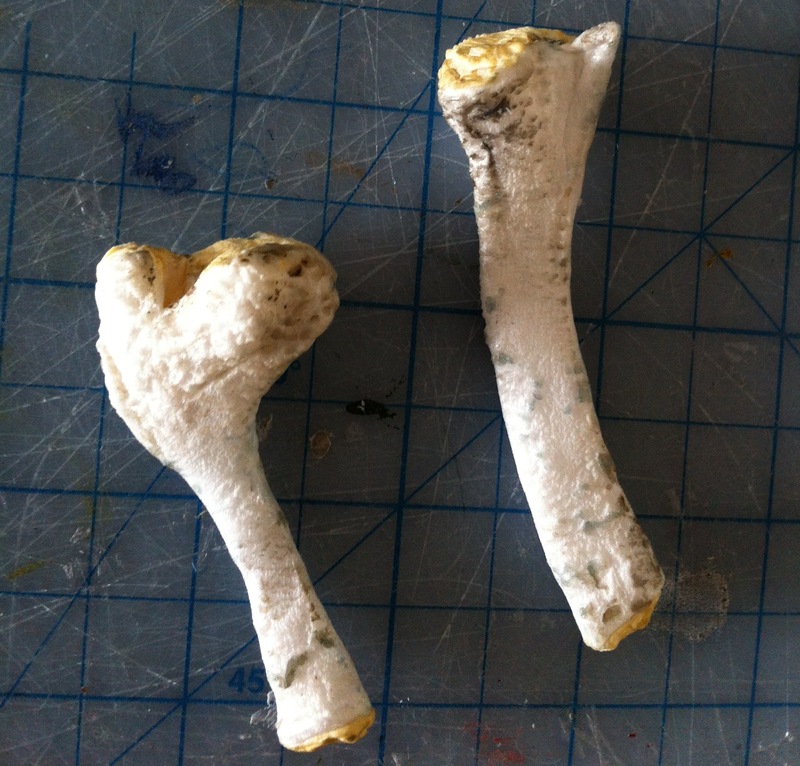 The yellow foam was used for the ends, which I had to sculpt. 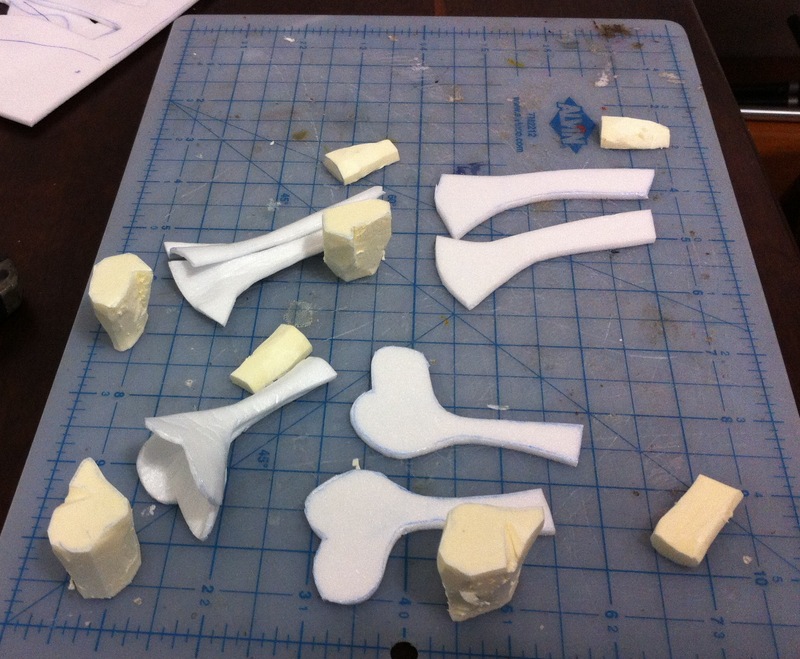 The parts after cutting out. 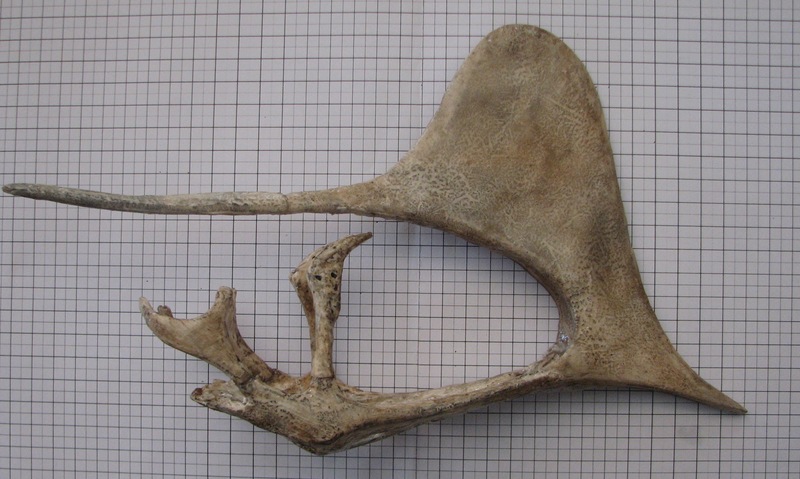 Partial assembly of scapulae and coracoids. 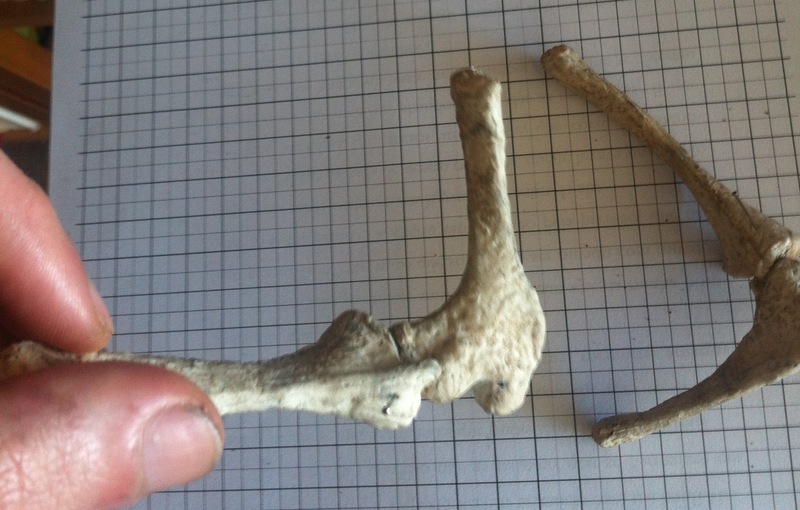 This is the distal end of the scapula. 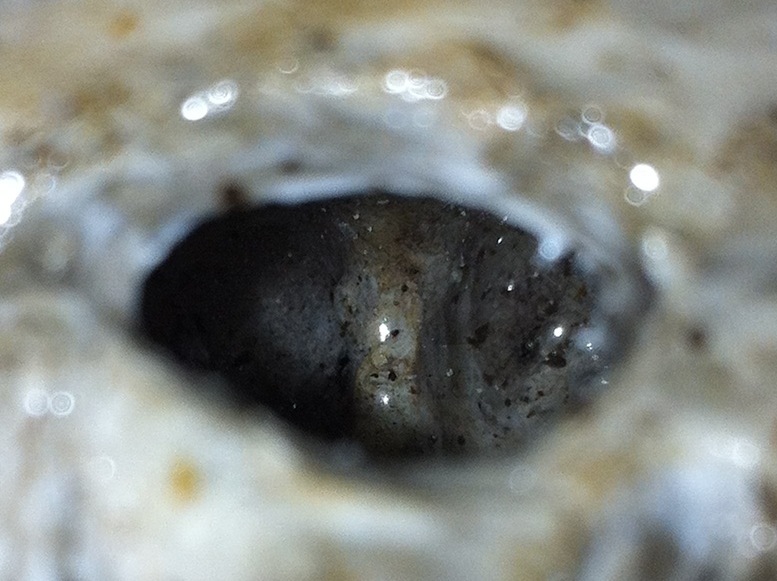 Since there were many photos, I was able to compare several angles, and see where it was curved, thick, thin, and other details. 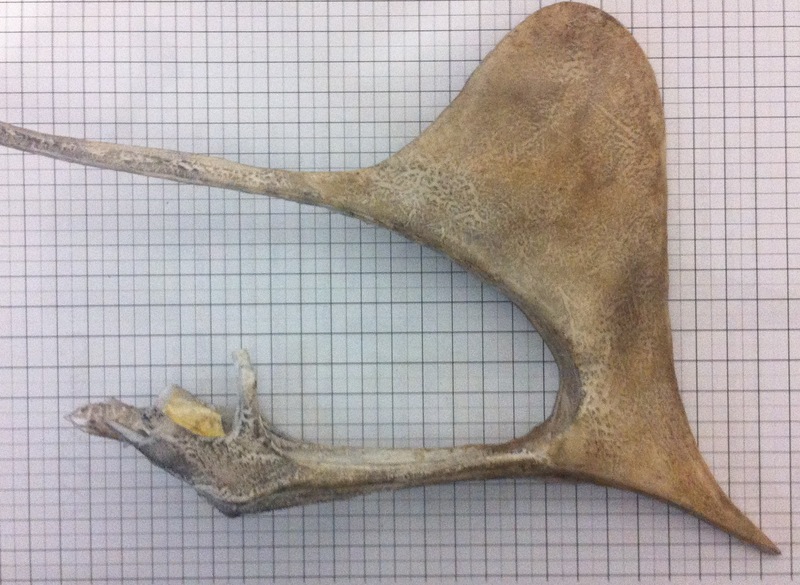 This is another side view of the scapula. 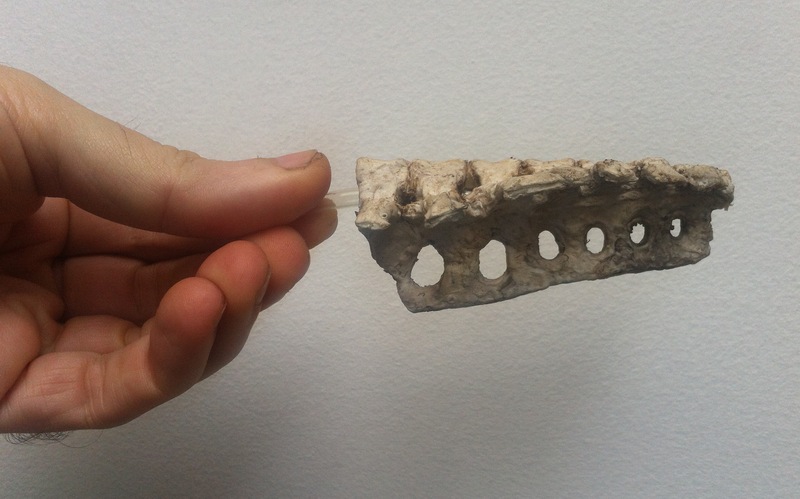 The sternum is quite flat, so I initially made a shape slightly larger than the photo, so I could then give it a curved aspect. 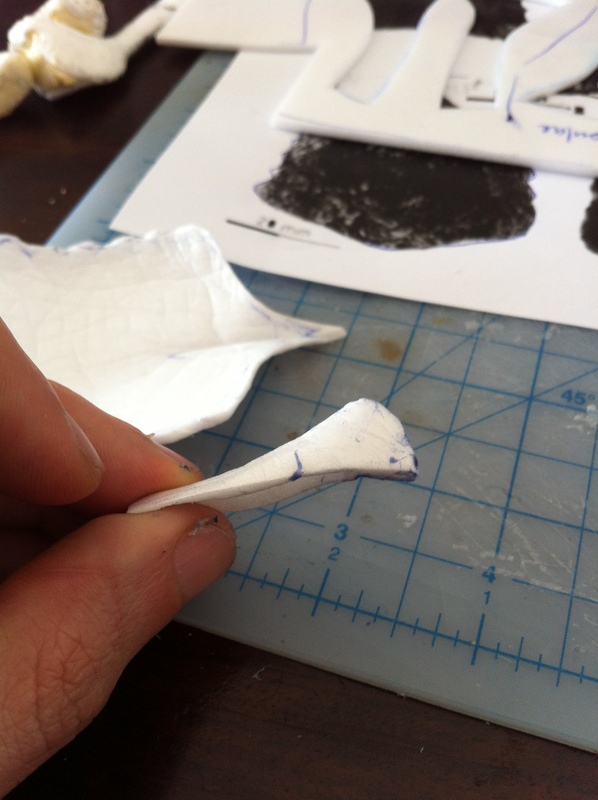 But the keel I had to make separately. 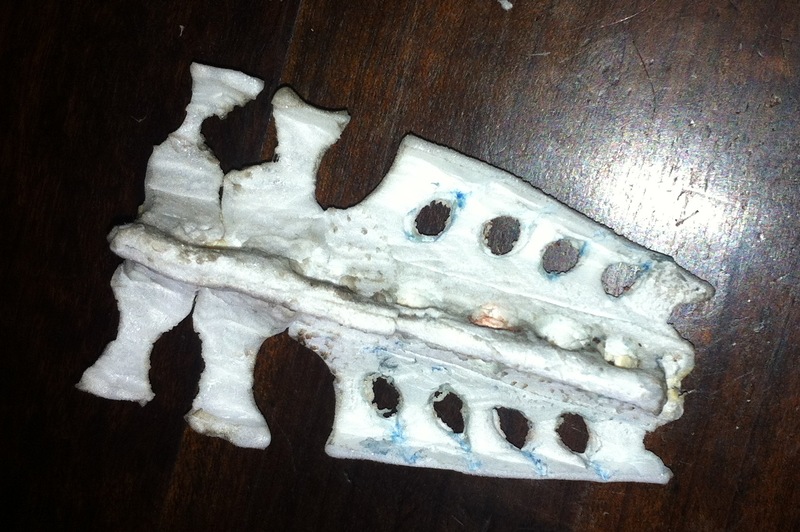 Here is a picture of the sternum with the keel attached shortly after treating with fire. 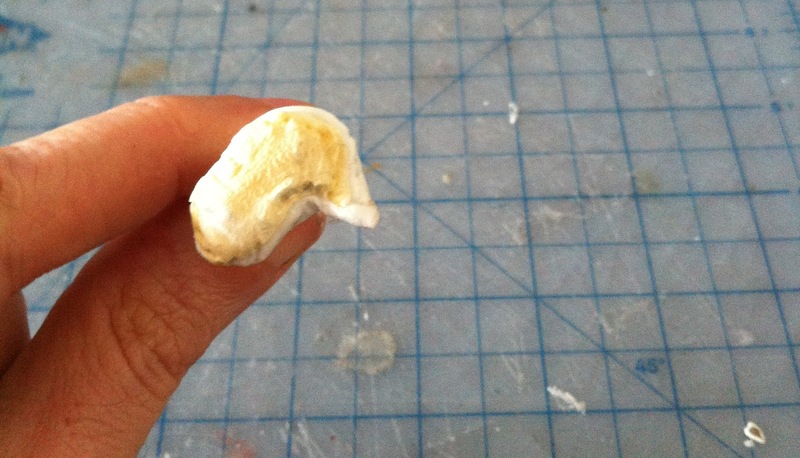 And here is a side view after applying modelling paste and coffee stains. 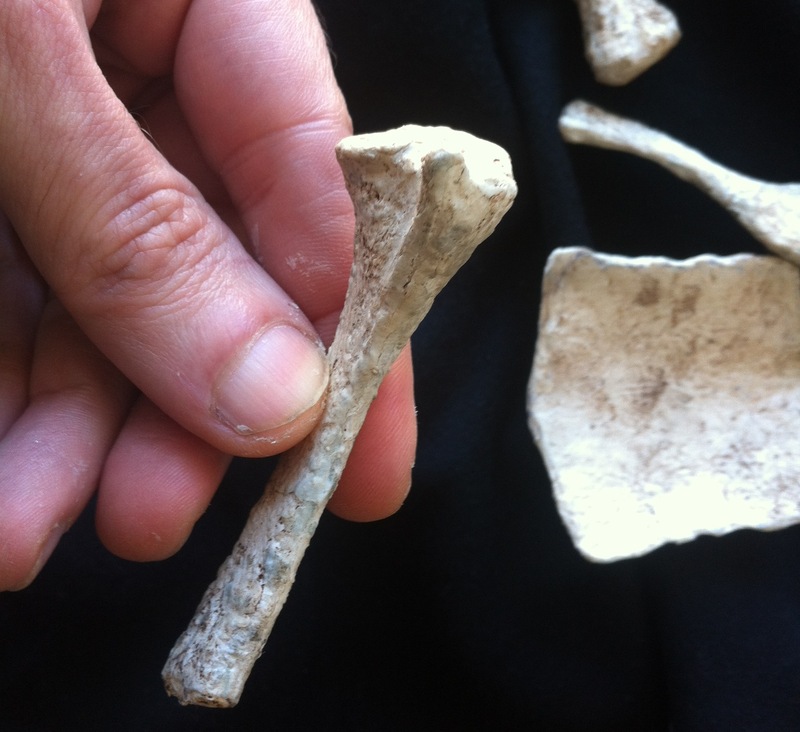 Compare it with the humerus. Now I have a big problem. 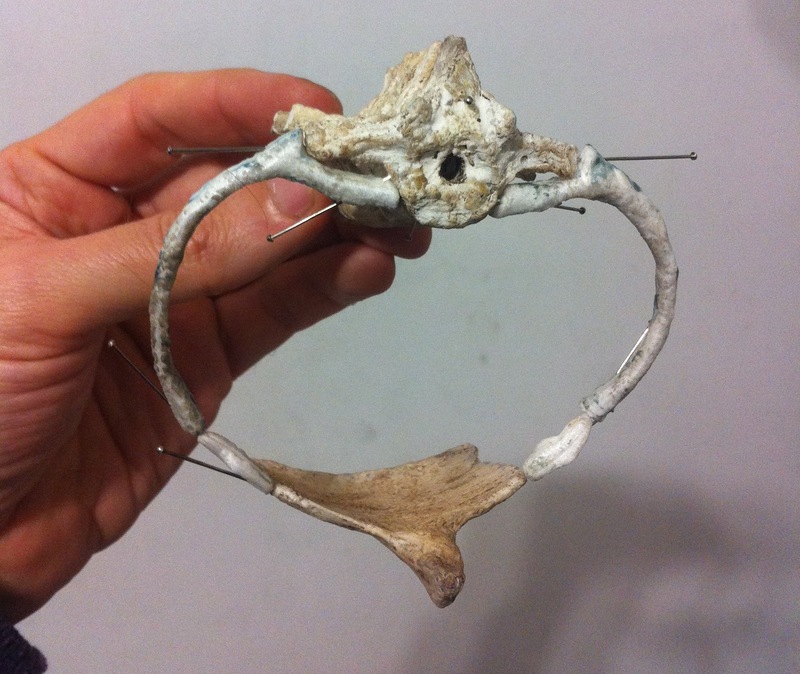 How to assemble the pectoral girdle. 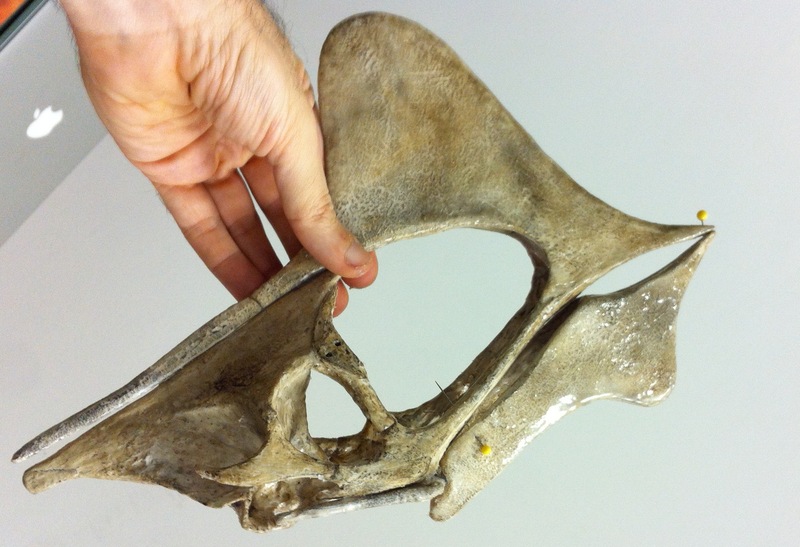 I still didn’t figure out exactly which ends of the scapula and coracoid connect to form the scapulocoracoid. 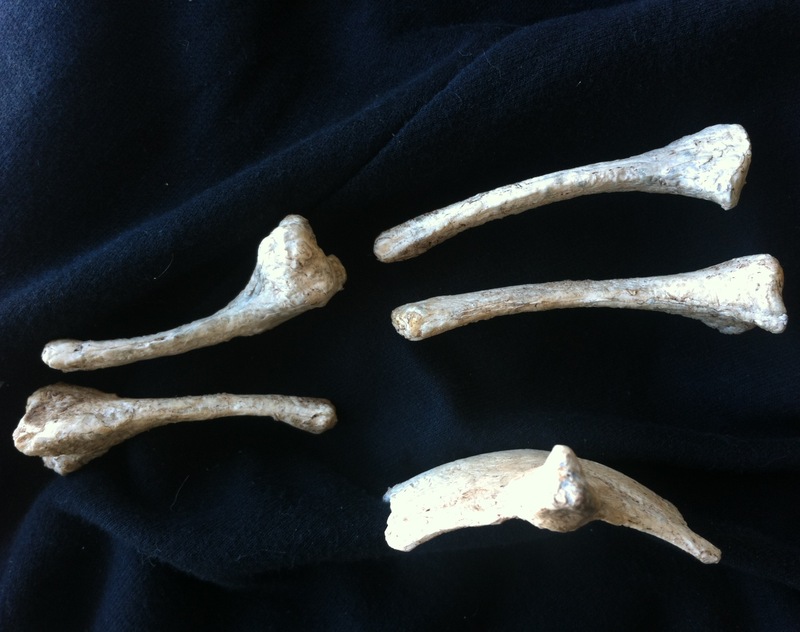 I might still have to twist the bone a bit since I may not have captured all the three-dimensional details from the photos. I spent a couple of hours trying different positions and gave up. 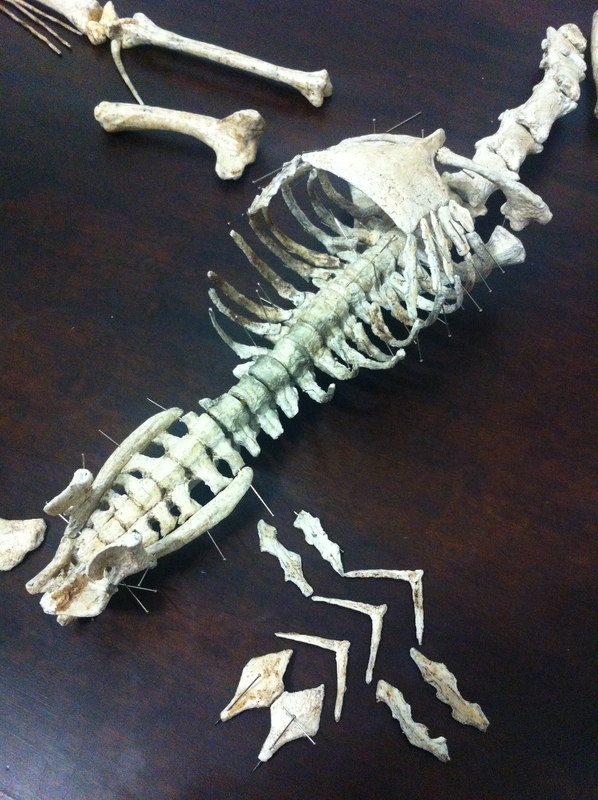 Tomorrow I will try to assemble the pelvic girdle with ribs, and it might be easier. Here are the final photos.